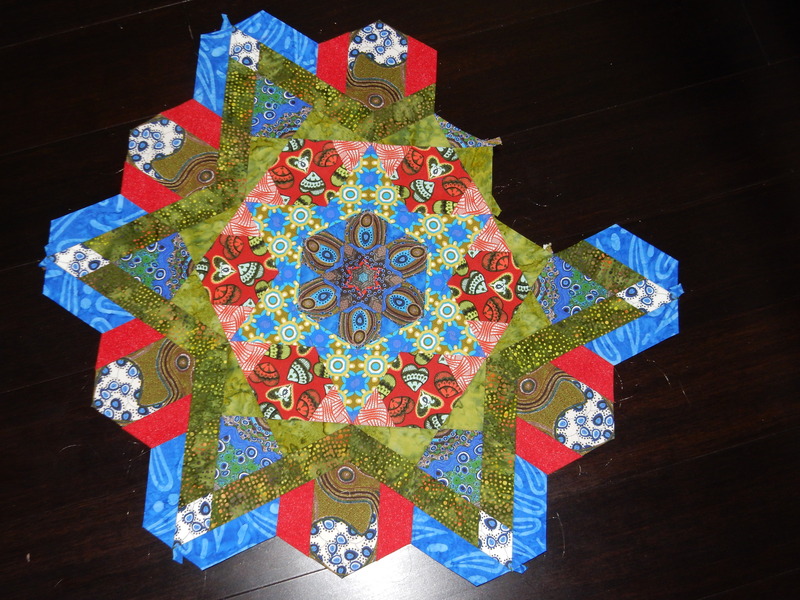 Yahoo, it’s still June and number 6 is done! 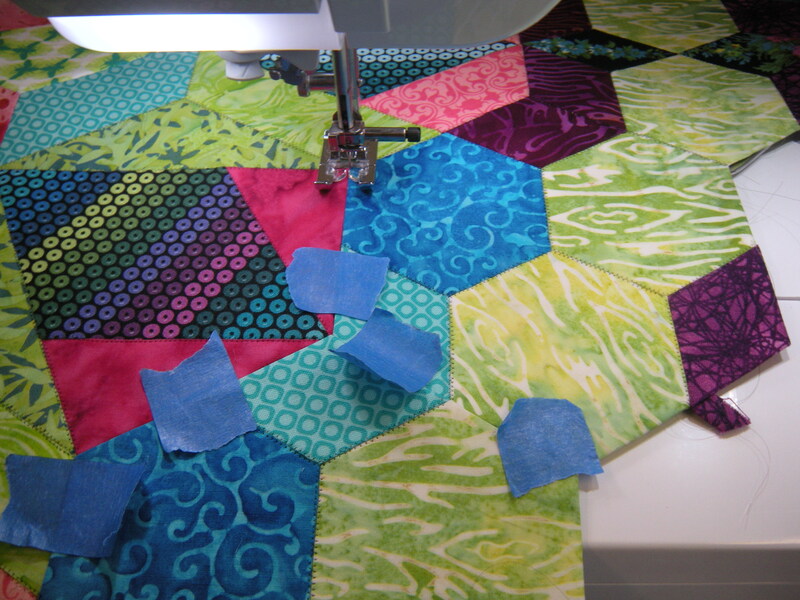 I’m still using the glue basting method that I learned from Katja’s wonderful book, The New Hexagon. 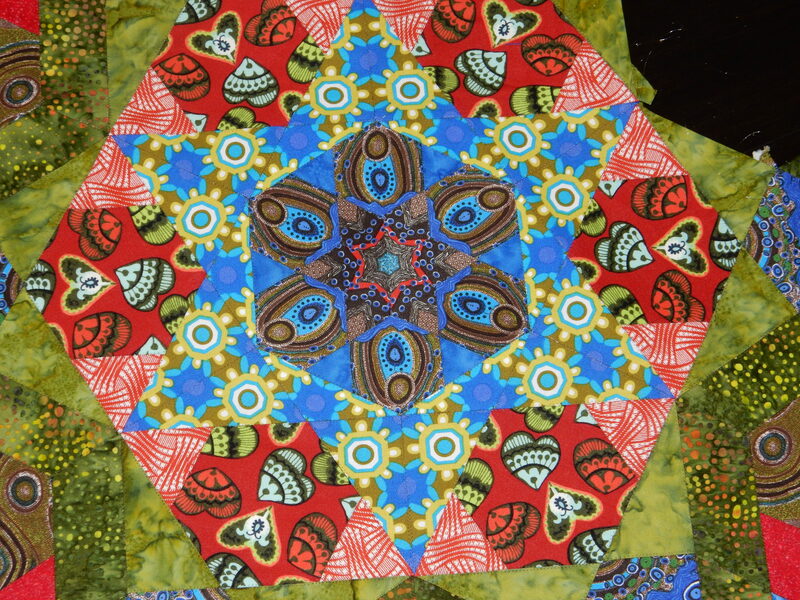 I hand stitched the center star, and completed the rest of the center and all the other rounds using invisible thread and a narrow zigzag. 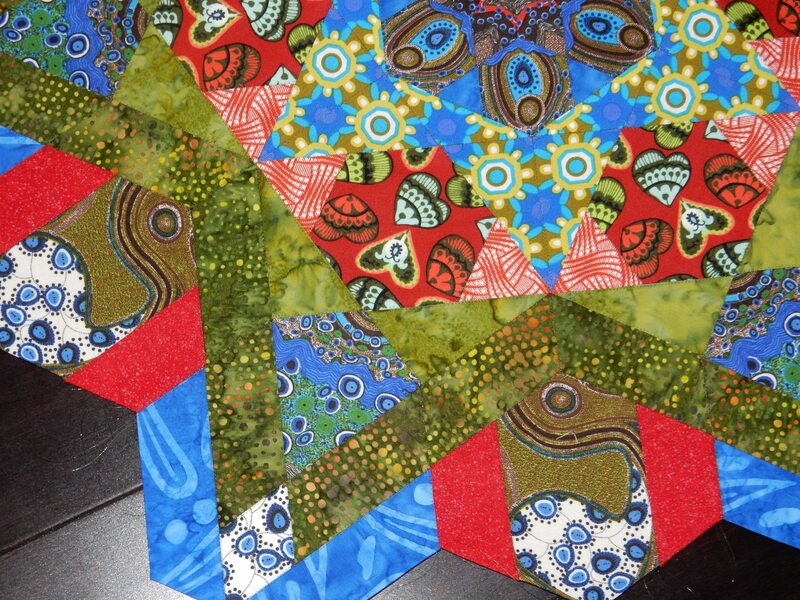 It’s all about feeling good about your projects, isn’t it? 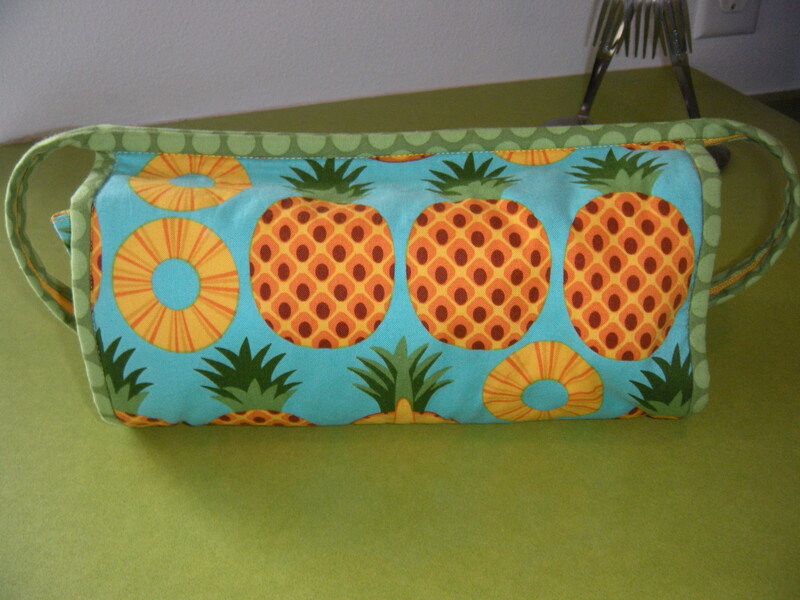 This project was so far out of my comfort zone when I approached it with the notion of hand sewing. I never could have made a dent in it! 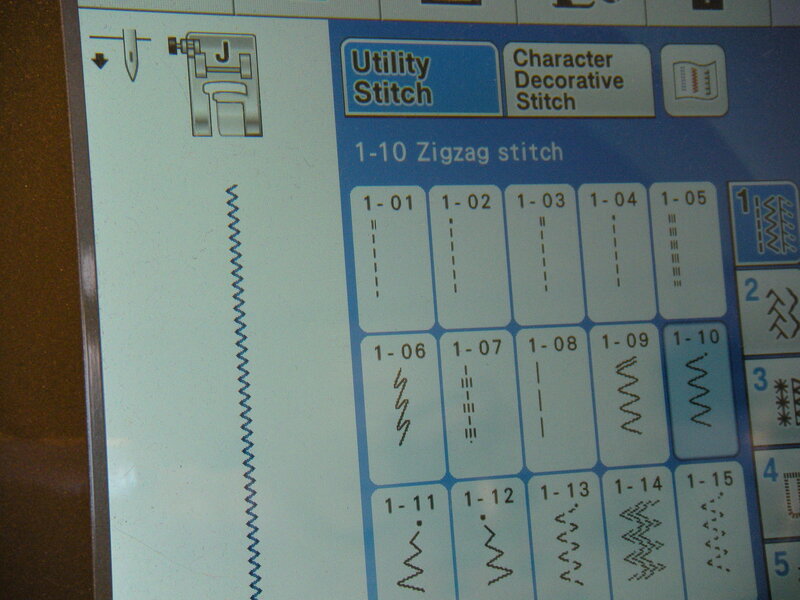 It’s so exciting to see stitchers from all over the world embracing this project. 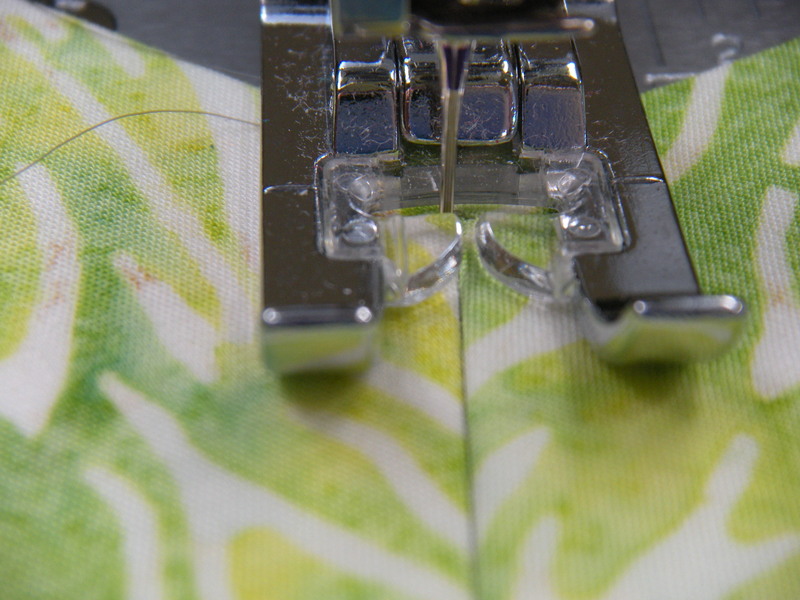 And all the ingenuity going into the fabric choices – and construction methods – makes it all the more inspirational. 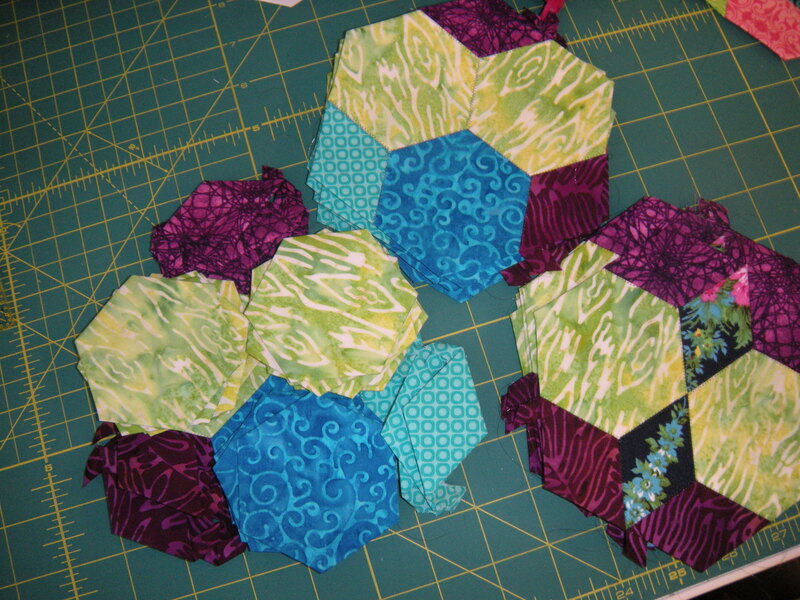 How am I going to tote around all those hexies? Don’t you just love those ah-ha! moments? 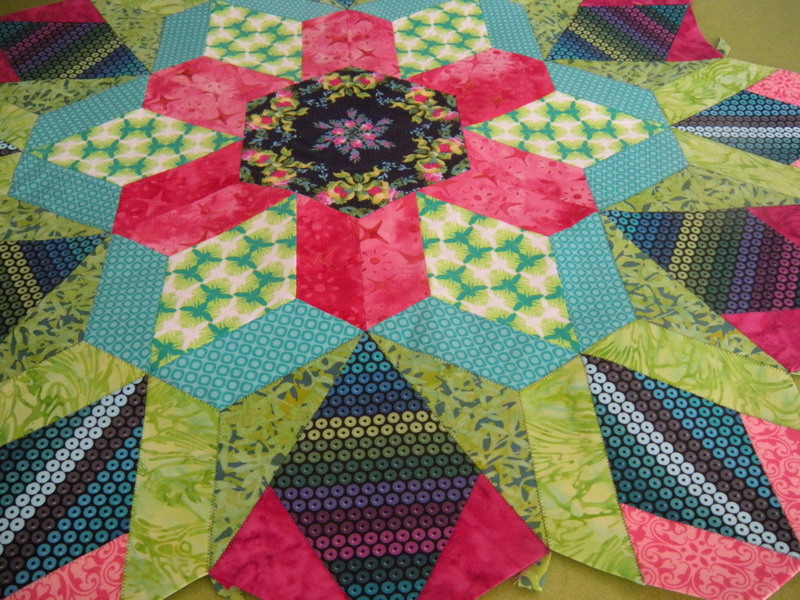 I’ve been working on rosette number two from the New Hexagon Millefiore Quilt-Along. 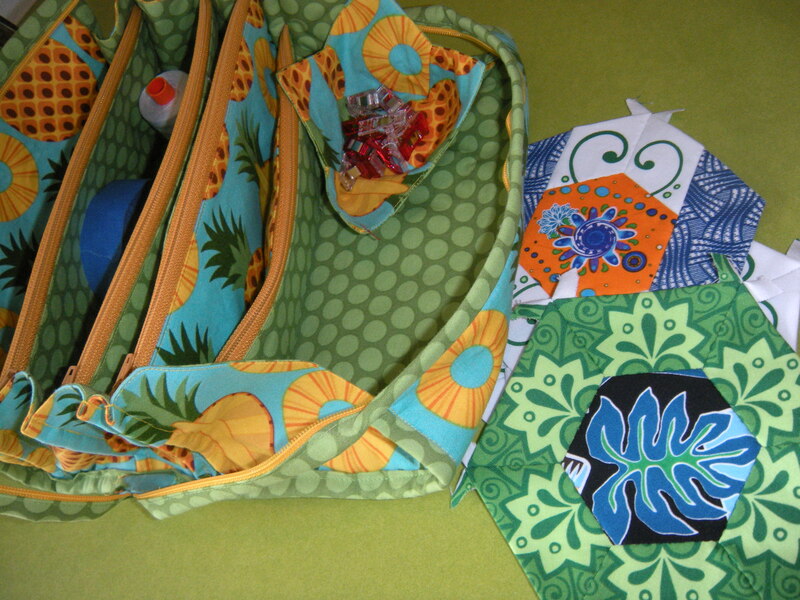 And I have bits and bobs spread all over the table next to my chair. Time to rein in my mess. 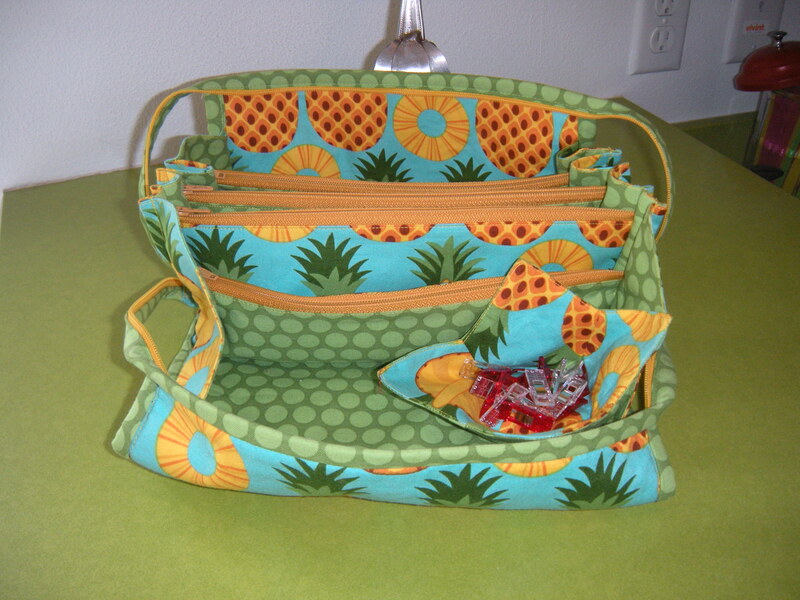 This has enough zipper compartments to make me do a happy dance! 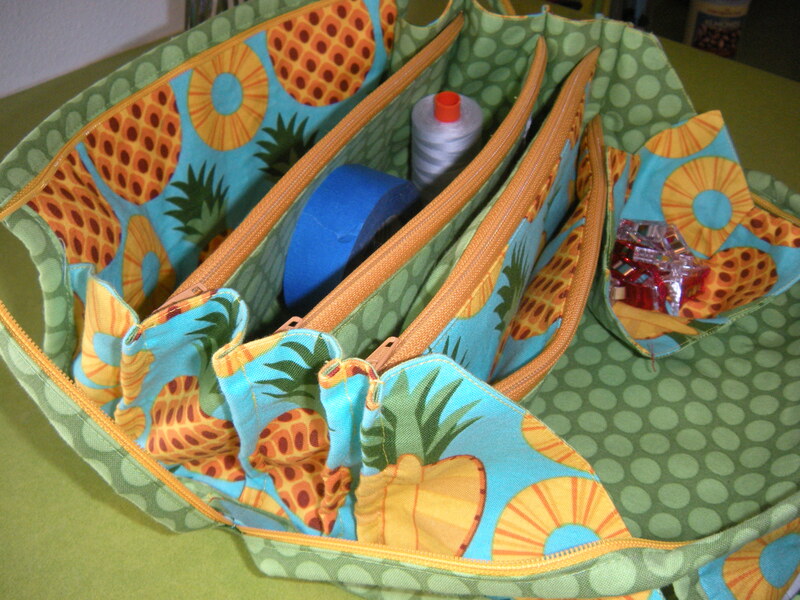 And I got to install four zippers! A place for everything, and everything in its’ place. 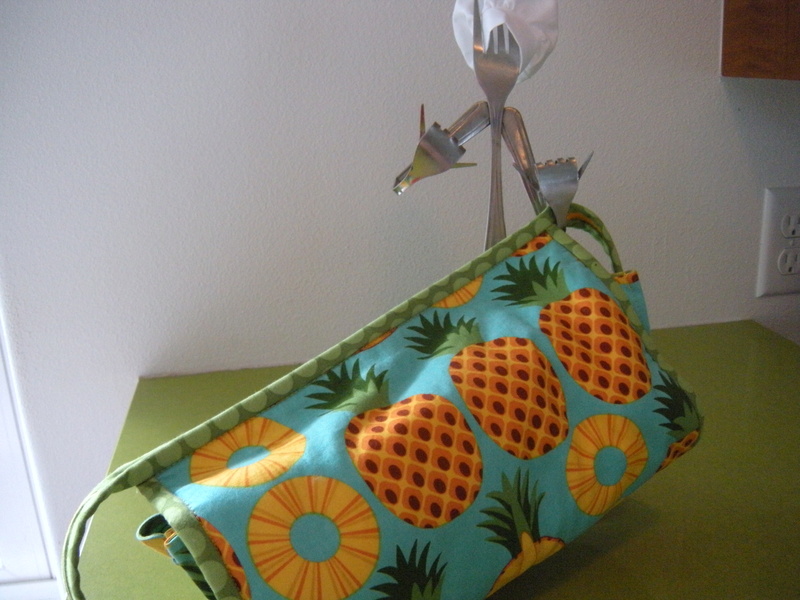 For those of you who are loving on my Shaka Hula Fork Chef Dude, here’s a gratuitous picture of his bad self. 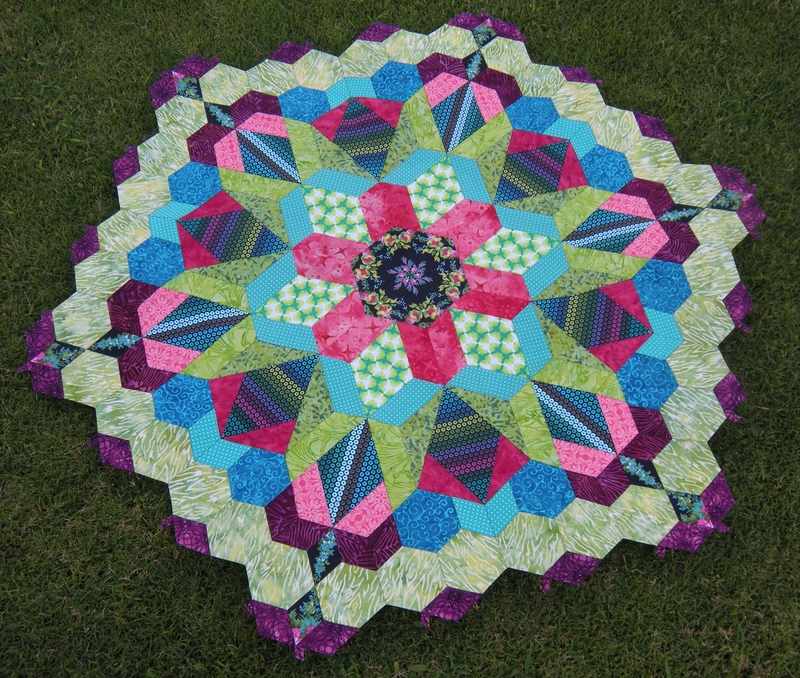 My wonderful Destiny is still in the shop. 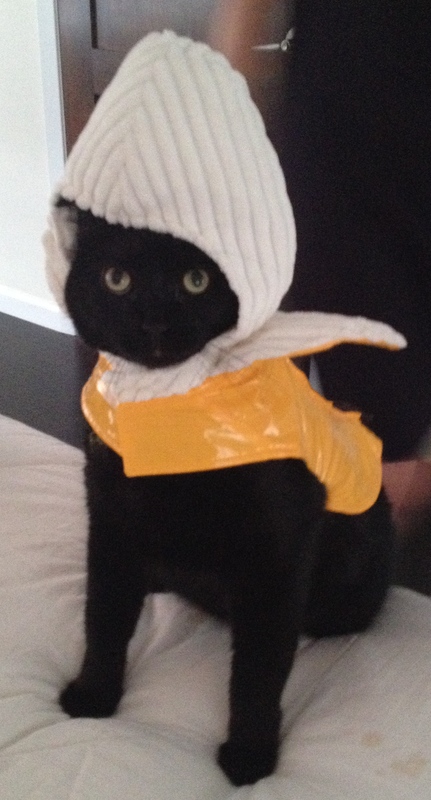 You will never believe what I ended up doing all day yesterday. Just try to guess. What is the date today? I believe it is NOT February. It’s still in the Januaries. 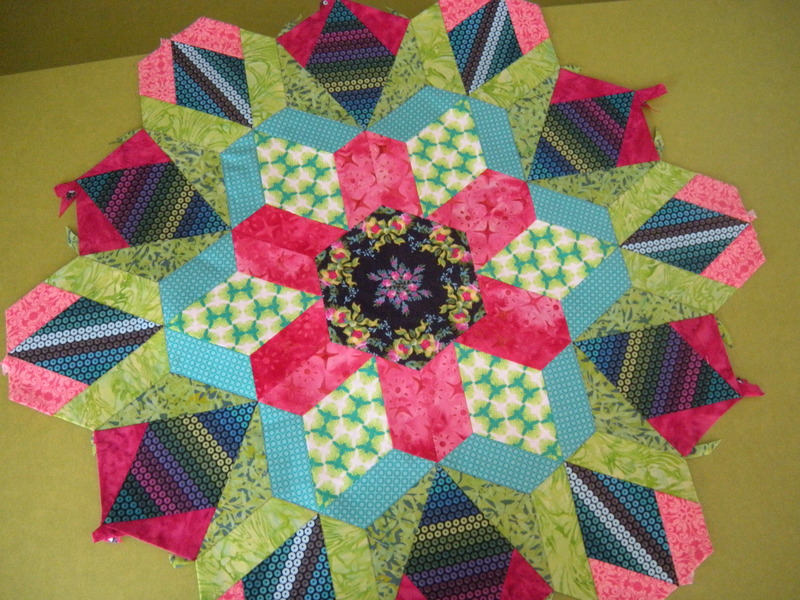 And my rosette #1 is done. I’m not being braggy, I am making a statement that I did not believe would ever be true. 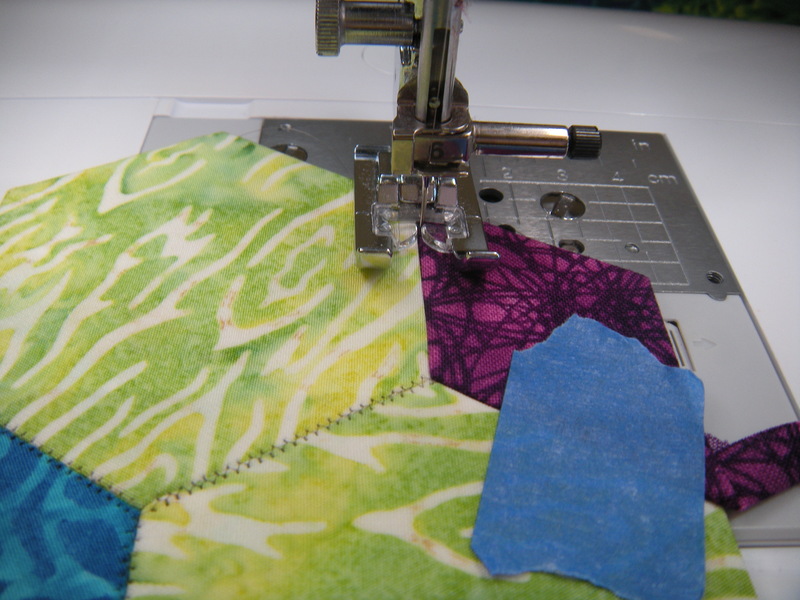 And if I had kept on with my turtle-paced, nay, snail-paced hand sewing, I sure wouldn’t have a finished rosette to show you now. Shall we finish up the tutorial now? 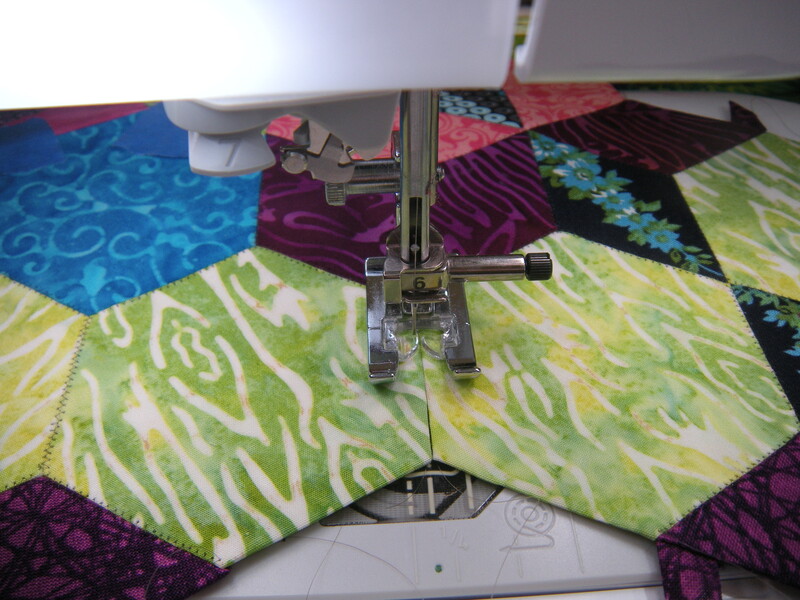 Let’s put the final round on the rosette. 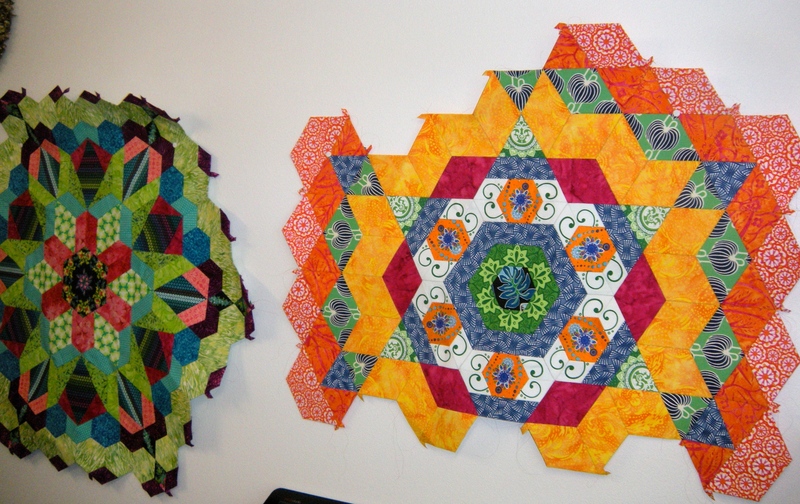 There are 18 hexagons in the final row, 6 each of three different configurations. (If I may point out the obvious, make sure you don’t mix up your mirror-image Maries.) 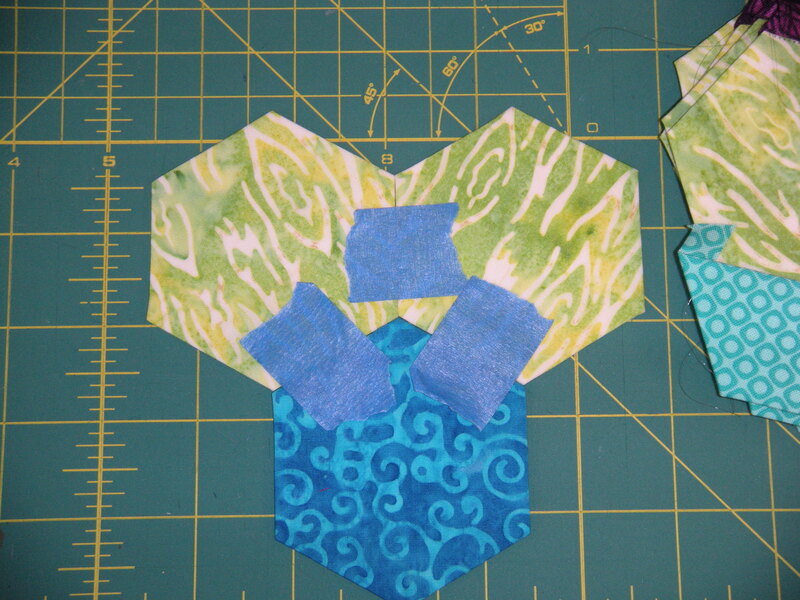 Using a bunch of of the blue painter’s tape, line up your first two blocks. This shows Brandi and Marie taped to the second round. 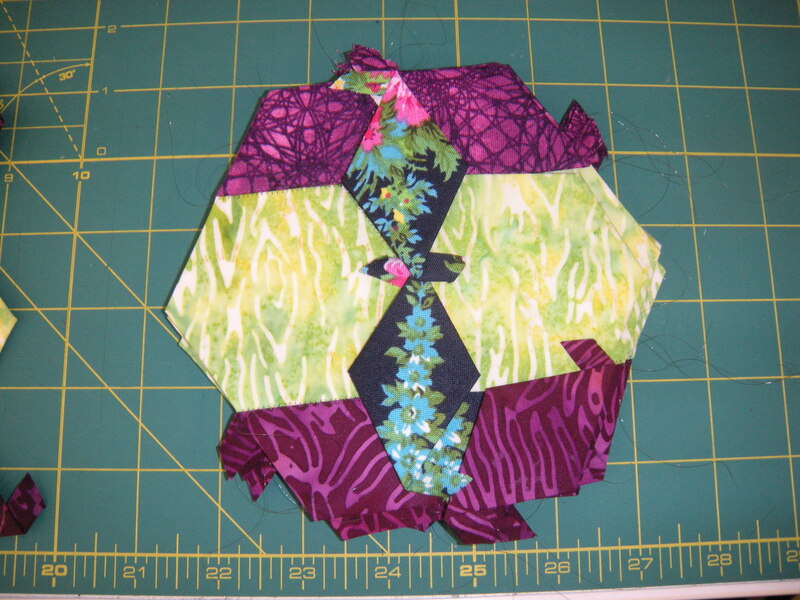 We’re going to attach Brandi first; Brandi is the block with the two floral diamonds in it. 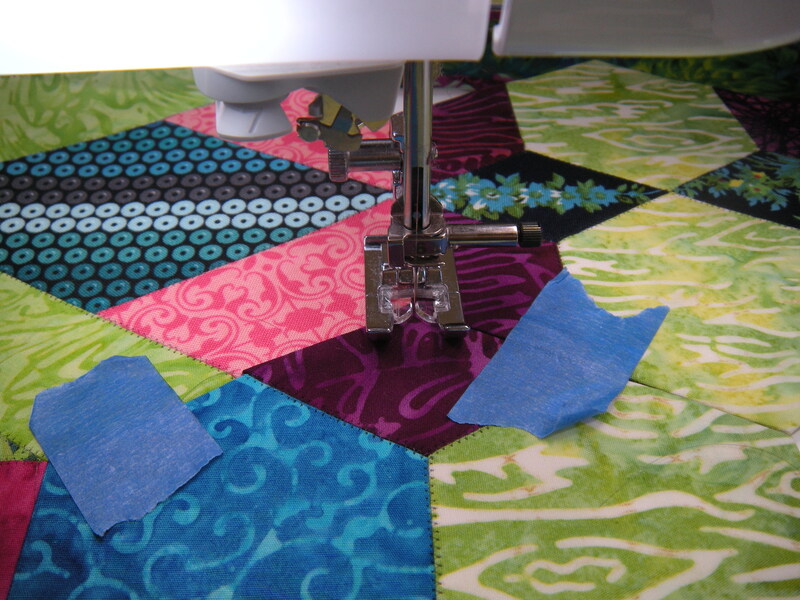 (The second block needs to be taped in place because Brandi is joined to it in the first seam. 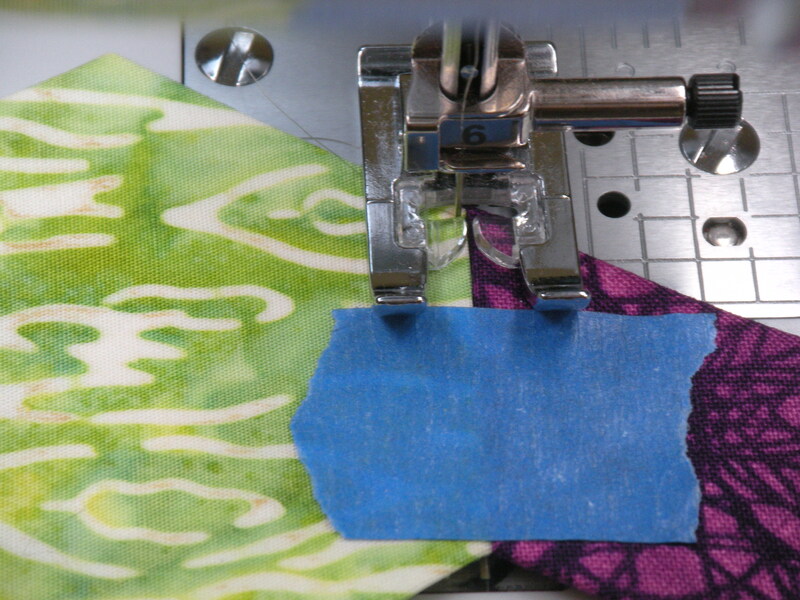 Same procedure as before, removing tape, pivoting, and lock stitching. 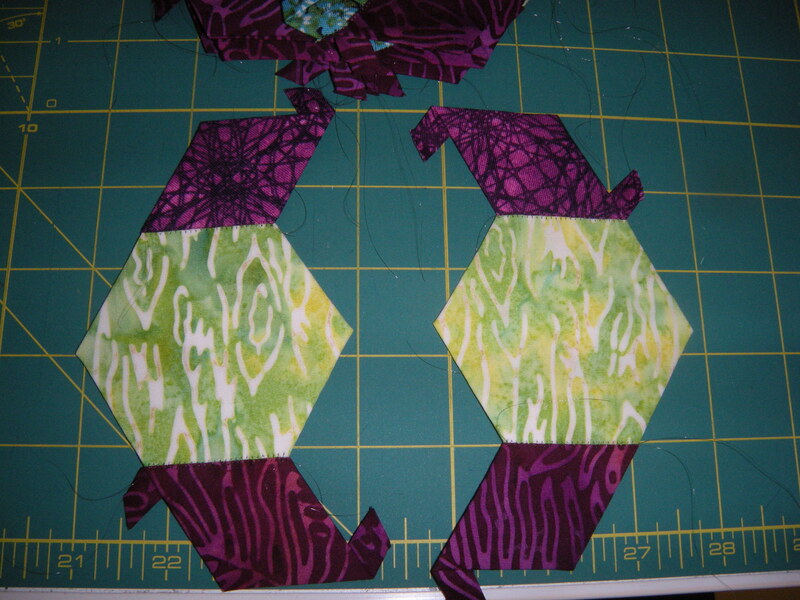 This is the same was each of the subsequent blocks will be joined, so tape on your next Marie and go for it! 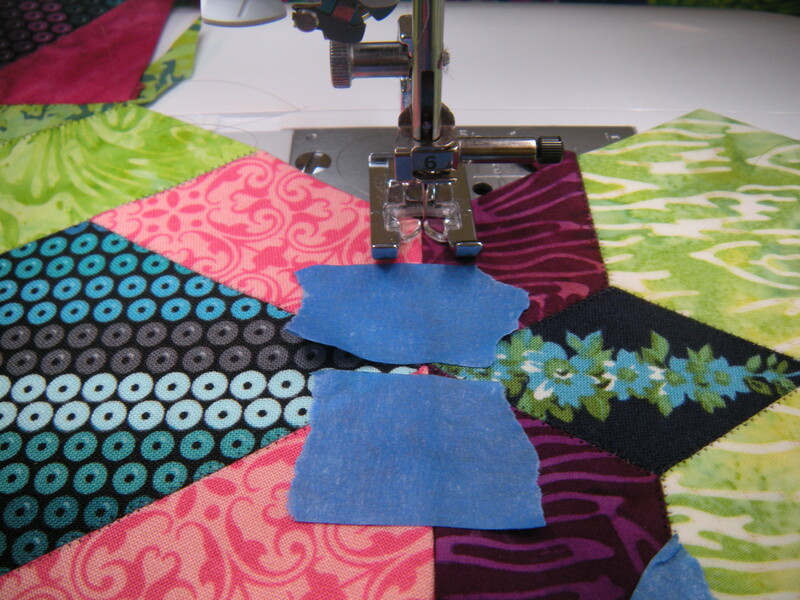 The stitching to join this block starts at the place where we pivoted sewing our first seam. In other words, at the place where Brandi and Marie both meet the row below. 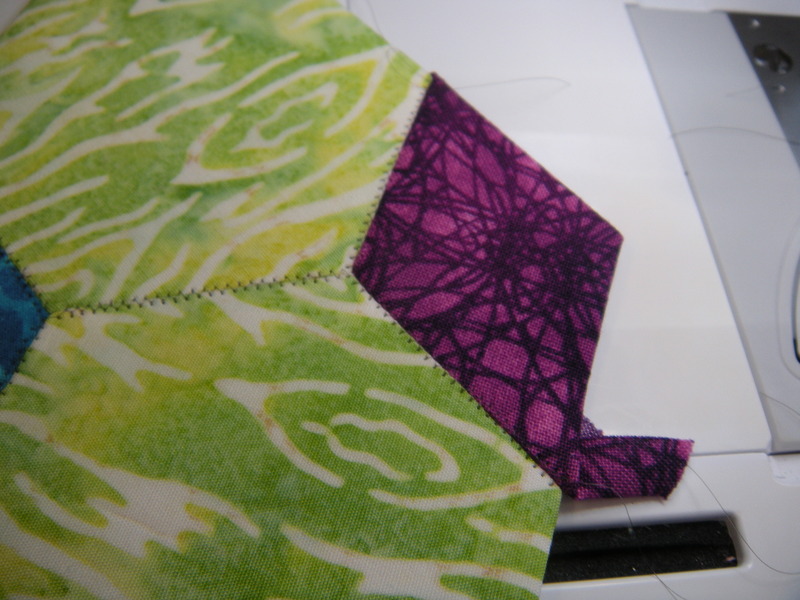 Sorry I don’t have a picture of the start of this seam. 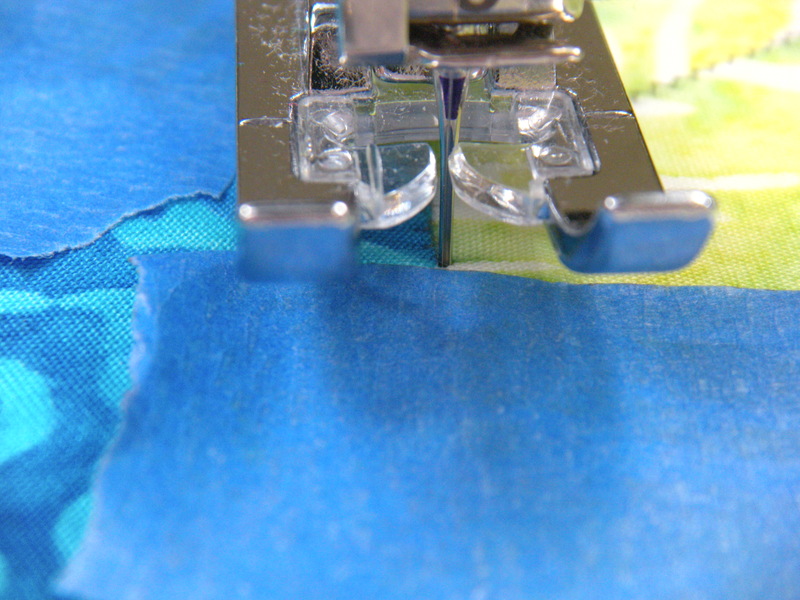 The first photo below shows the pivot after the first part of the seam is shown. 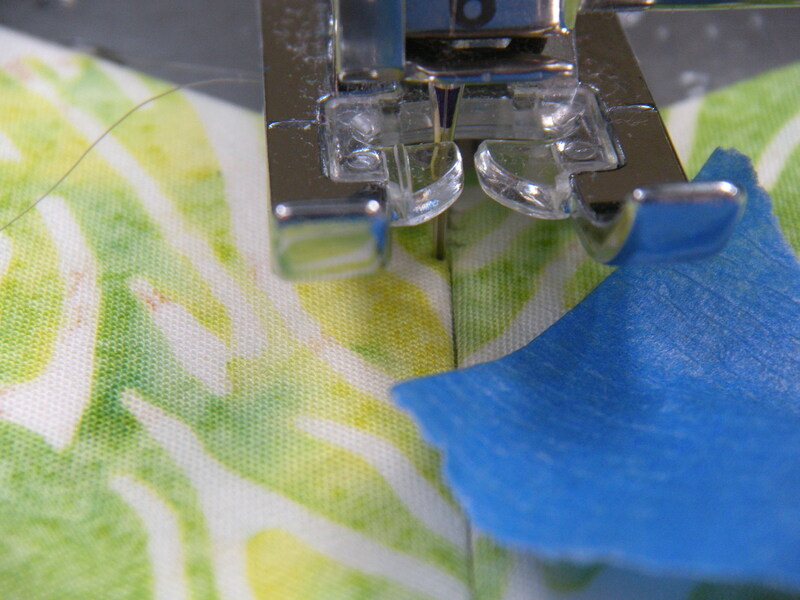 Notice that this seam will have two pivot points. Time to lather, rinse and repeat my friends. I’ll wait here for you. To get the papers out of the back, just follow Katja’s instructions in the book. 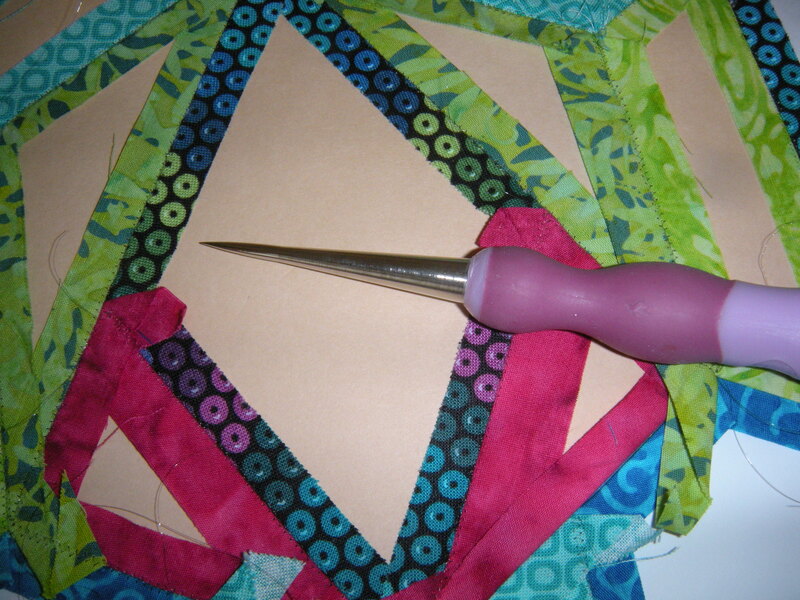 I am always looking for a reason to use fun tools, so I love an excuse to get out my pointy little awl. 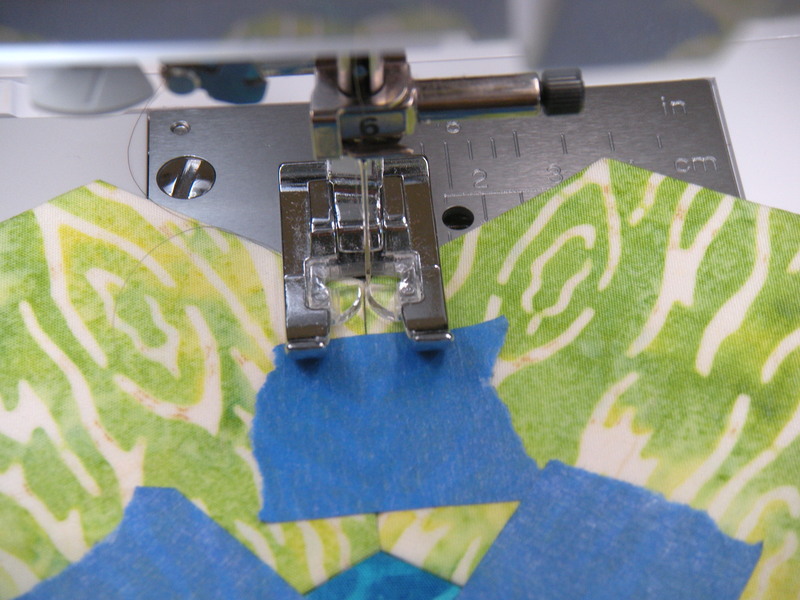 Think of this like paper dolls, the kind that punch out. I always loved those as a kid. 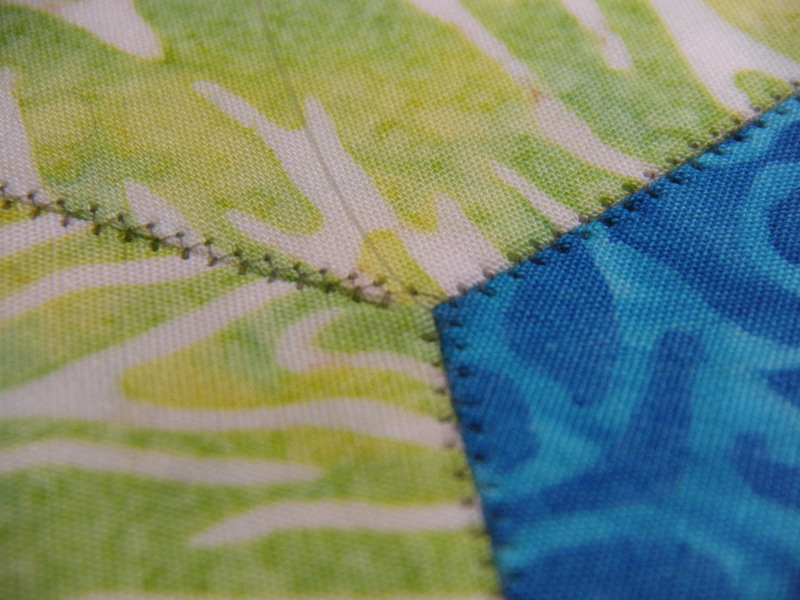 The papers have been stitched in around the edges, but they are now perforated. Gently pull on them, and if they don’t release right away, punch them out! What more would it take to convince you to try this? Go buy that book. Dig through your collection. You know you want to. 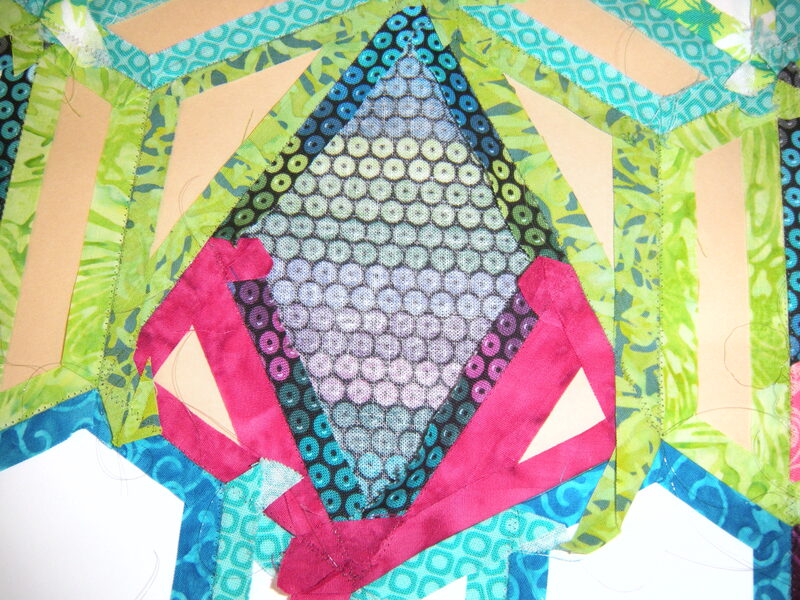 This process rocks! I hope some of you have had a chance to try it! I am still amazed and pleased with the results. First, a re-cap of part one and some questions that have come up. 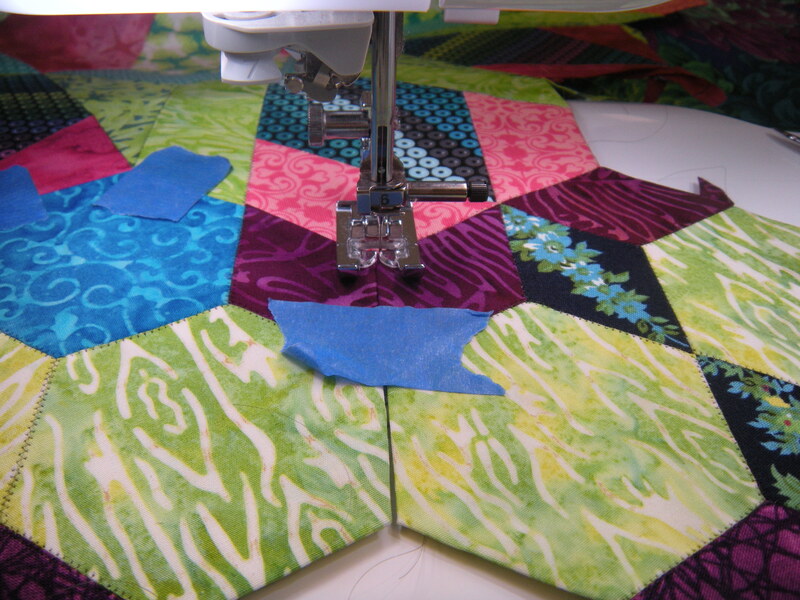 Then, on to part two, sure to have your project speeding along. 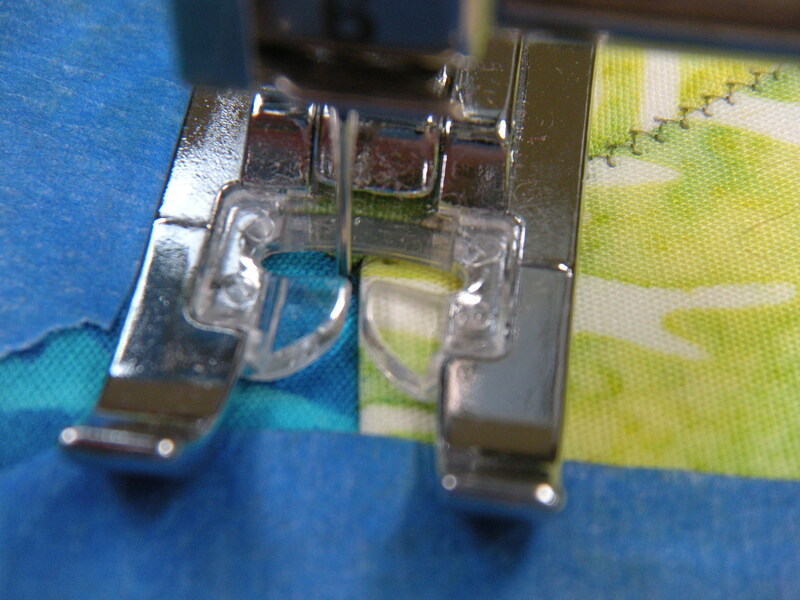 Short and narrow zig-zag stitch. 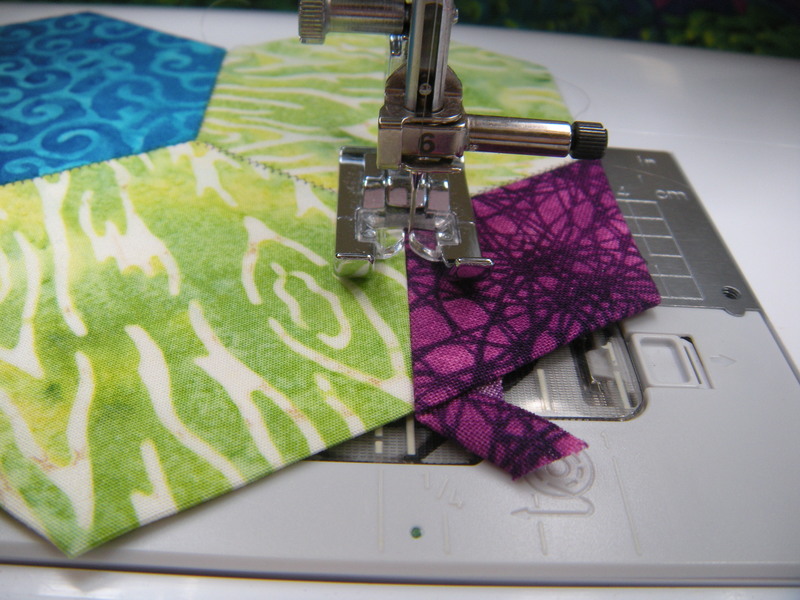 Got your thin, sharp needle loaded? And the smoke-colored invisible thread? 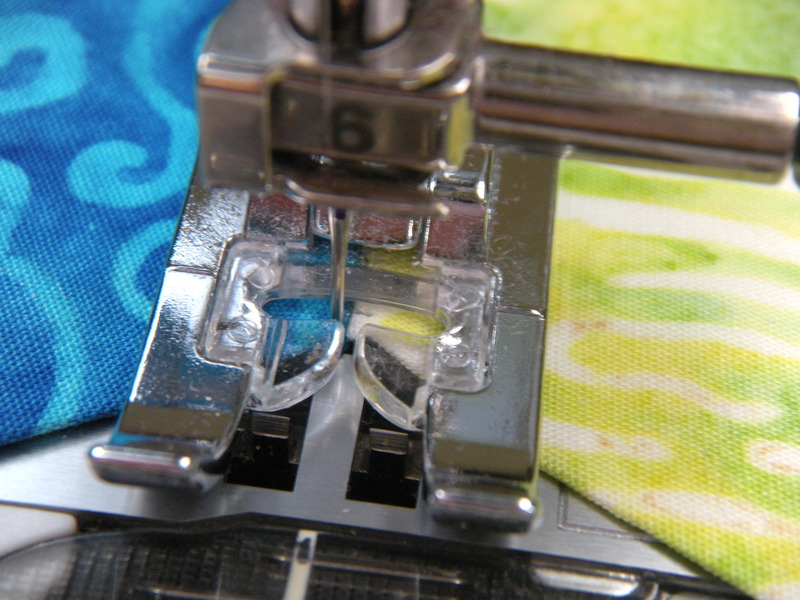 There’s a reason I’m using the smoke-colored instead of the clear invisible thread. Smoke blends right into the fabric, the clear stuff looks shiny. 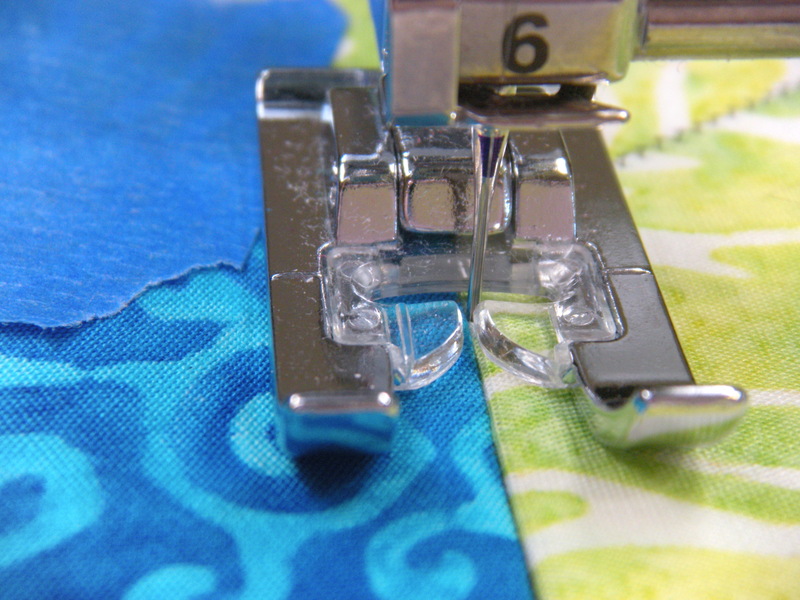 Always use a lockstitch (stitch 2 or 3 times in the same hole) at the beginning and end of each seam. 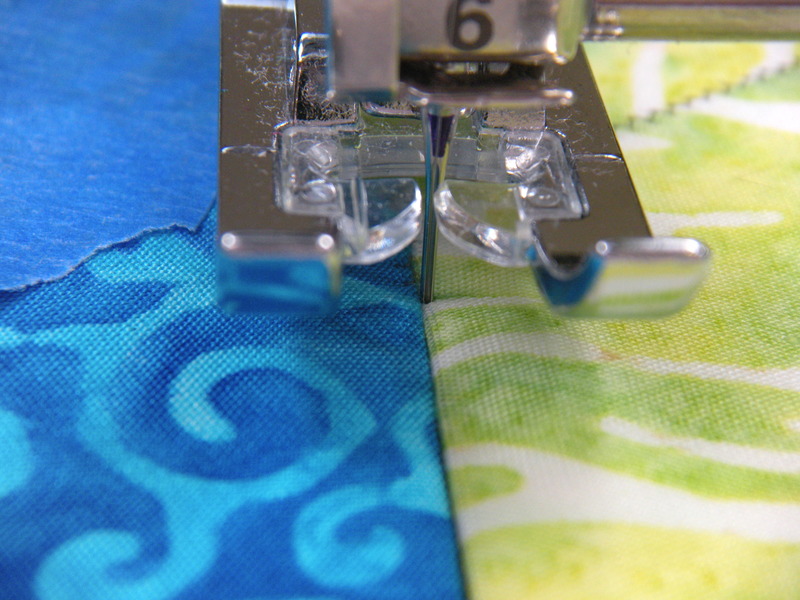 Don’t cut the threads short – I leave mine 2 or 3 inches. We don’t want scratchy whiskers on the rosettes! 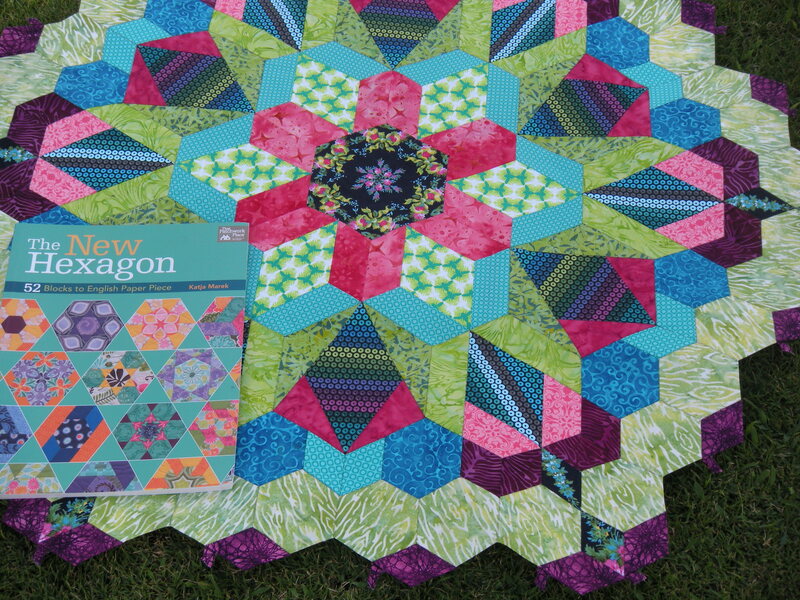 And if you have somehow made it this far, yet don’t know what we are talking about, head over to Katja’s website and learn more about the New Hexagon Millefiore Quilt-Along. 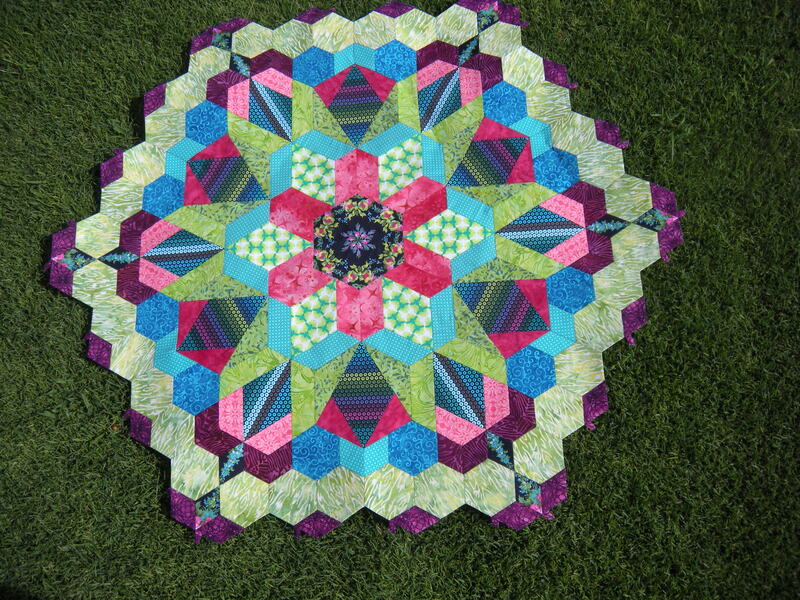 http://www.katjasquiltshoppe.com And definitely check out the FB page The New Hexagon – Millefiore Quilt-Along. 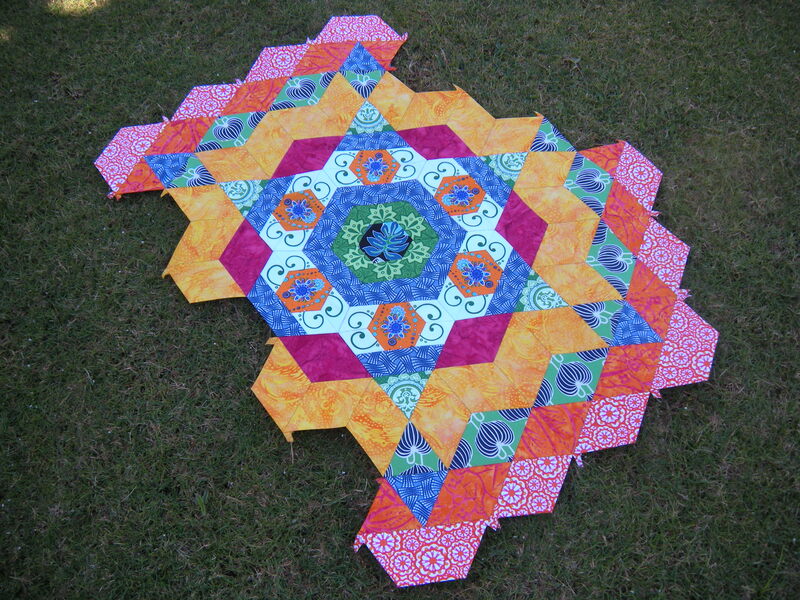 This is block one from the outer row of rosette one. 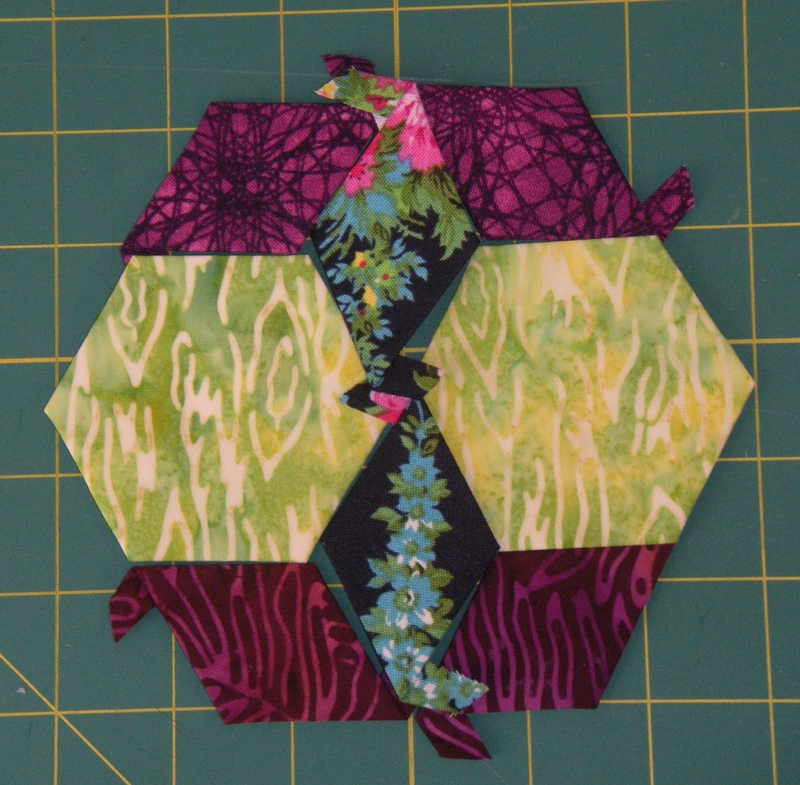 Six pieces in the hexagon, I decided that the best way to start was to join the three hexies in the center together first. I used my painter’s tape to hold the three together. 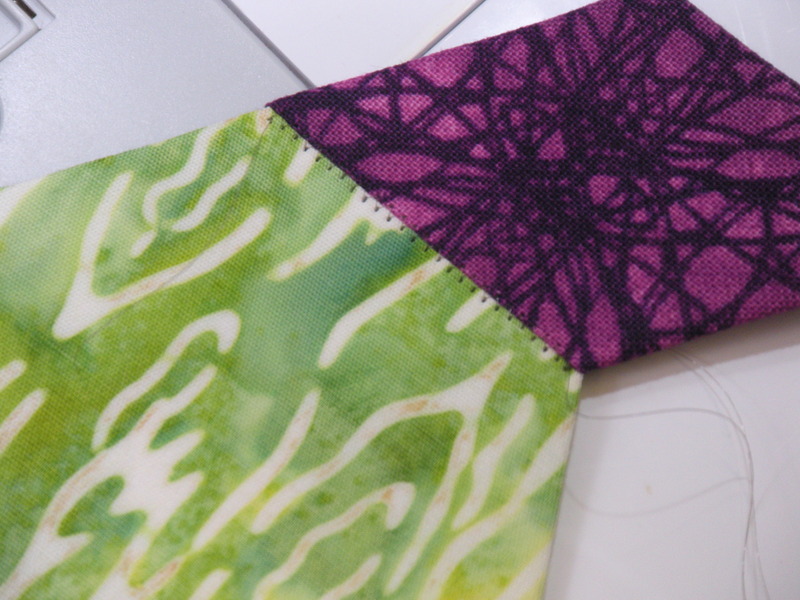 Lockstitch and zigzag, stopping with the needle down before hitting the tape. 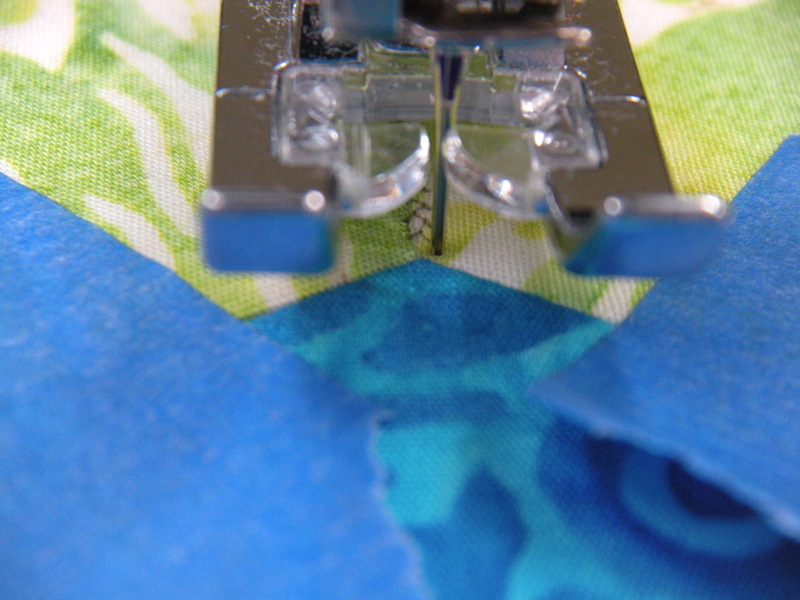 Don’t stitch through the tape – you can’t see where you’re going, and it will gum up your needle. 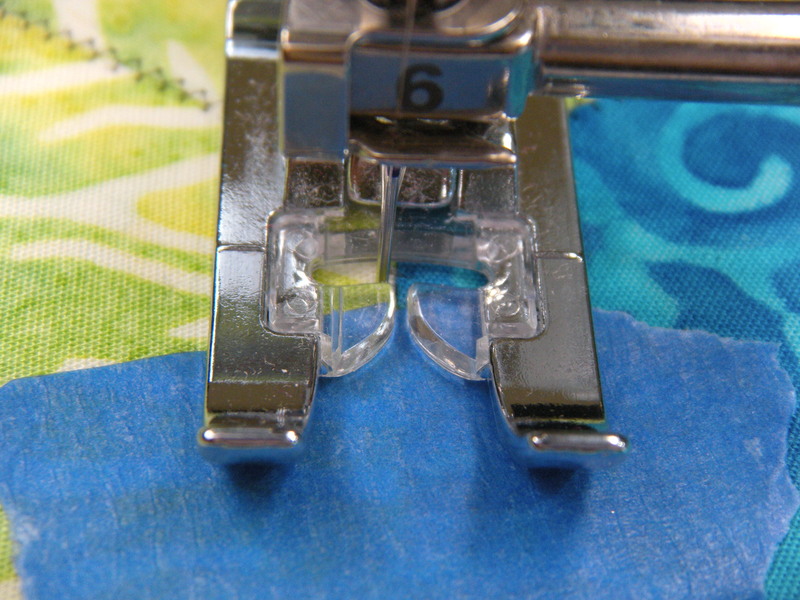 Lift the presser foot. 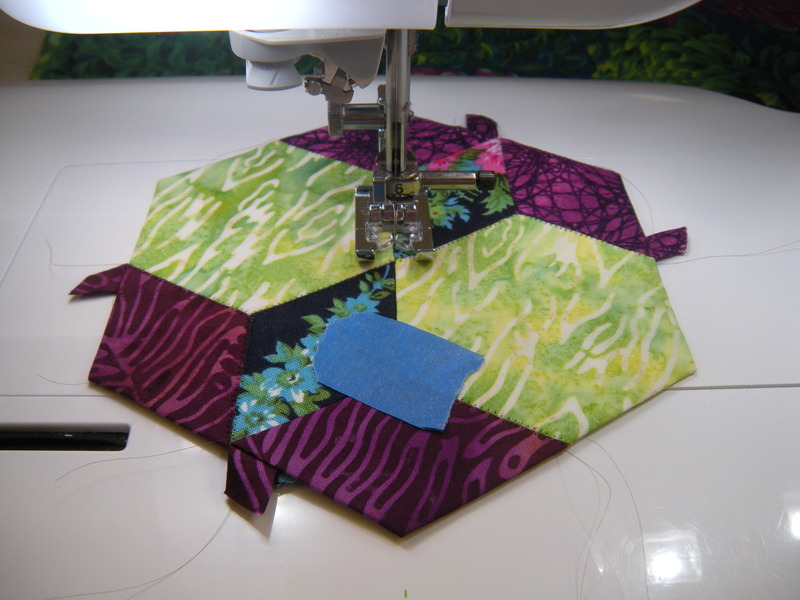 Lose the tape, stitch to the intersection. Pivot and continue. 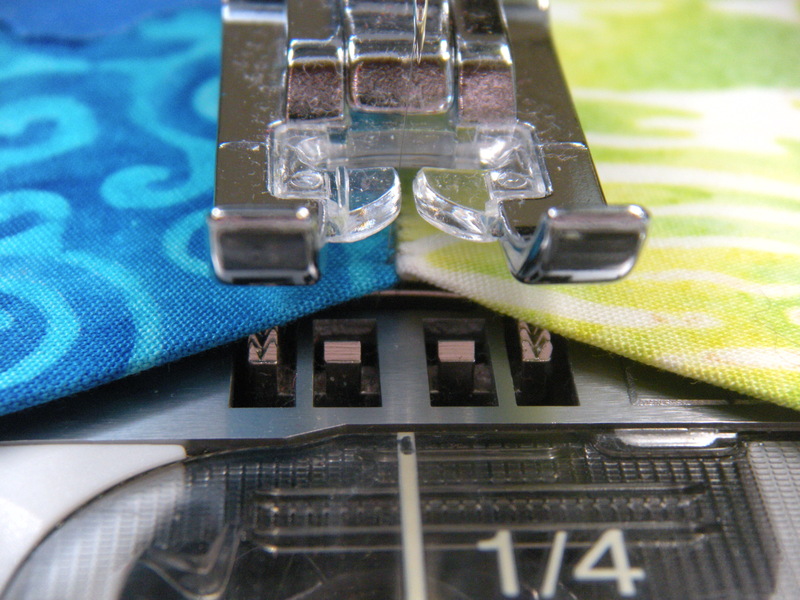 You’ll notice that the tape behind the presser foot in the last photo above remains in place. 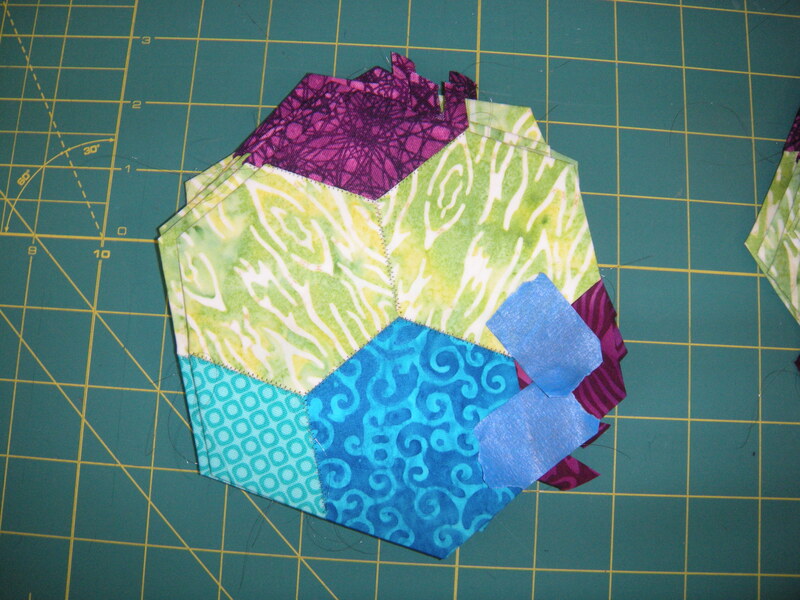 Keep it there so the blue hexie does not wiggle away from it’s position. 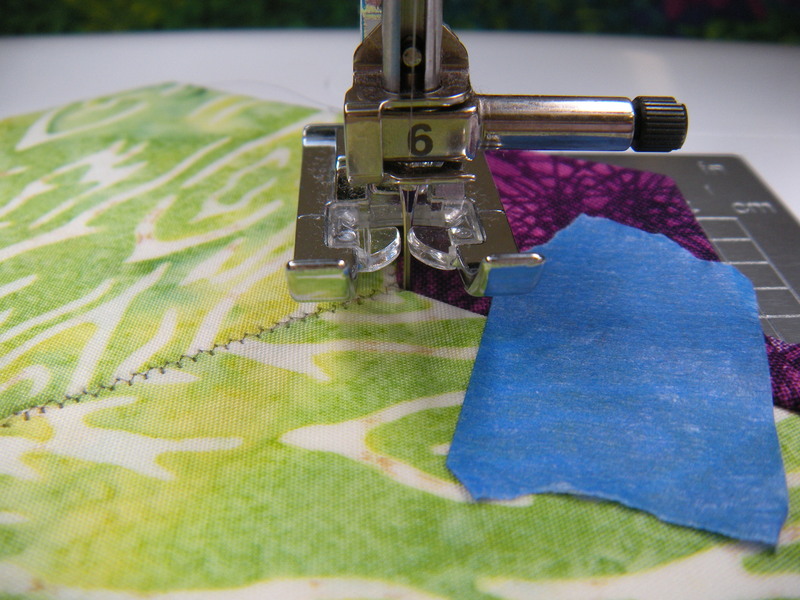 Start the seam, remove the tape, finish the seam, lockstitch. Lather, rinse and repeat. 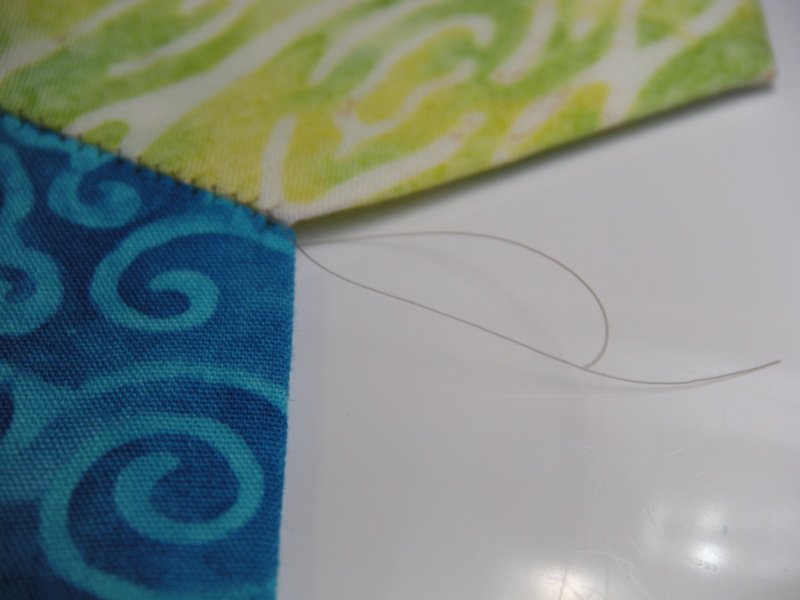 Look at those hairy little threads just dangling. 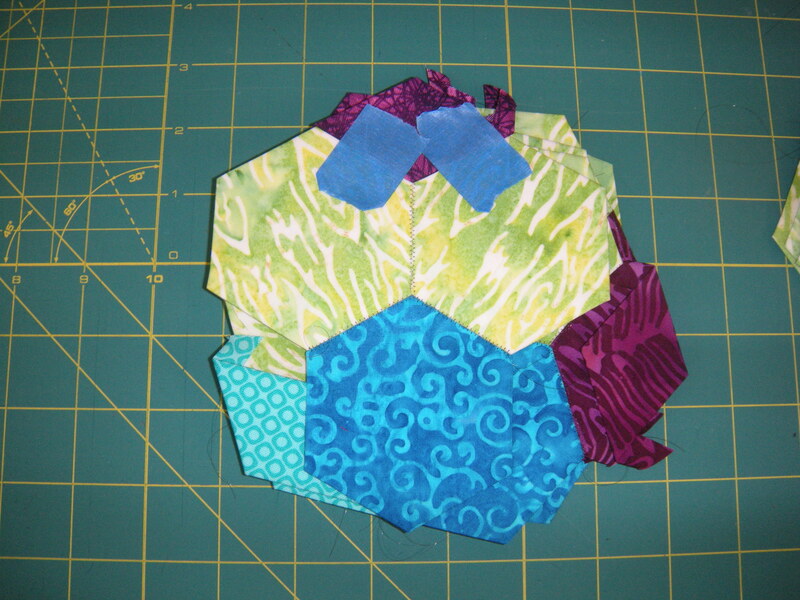 Now we’re going to do the seam joining this blue hexie to the other green/yellow hexie. 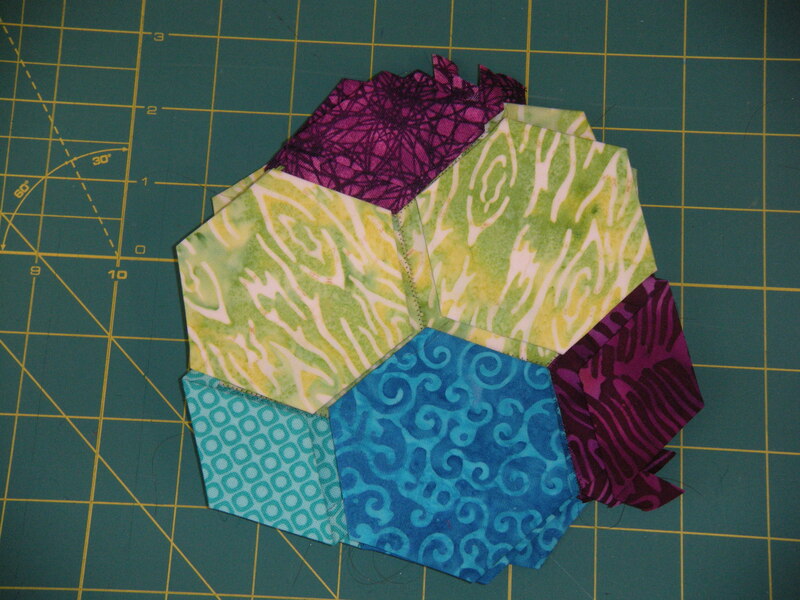 This is the first time we have to deal with a thread sticking out of the middle of a hexie. 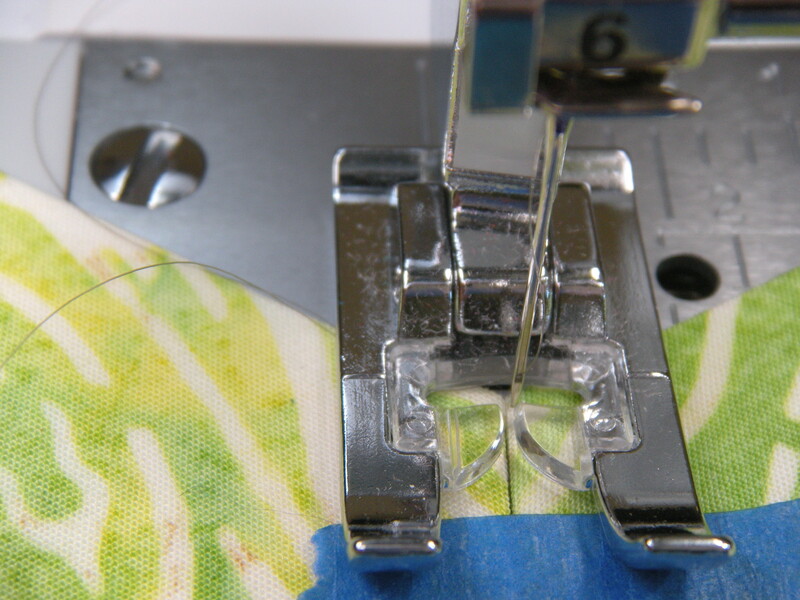 Flip that baby over, and use a pin or a needle to coax that thread end through to the wrong side. Then just leave it flopping around on the wrong side. Now we’re going to add the next piece, a purple diamond. 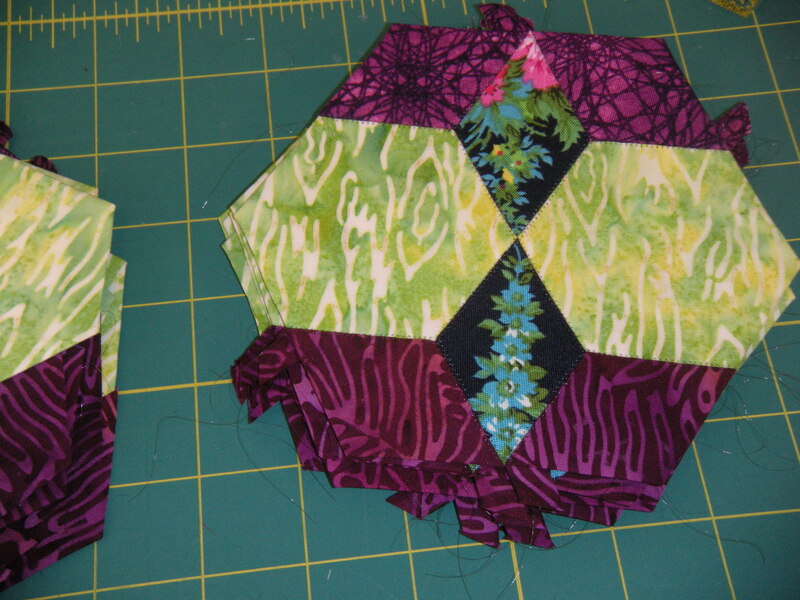 Notice that I have kept the pieces stacked the same way they are to be constructed. 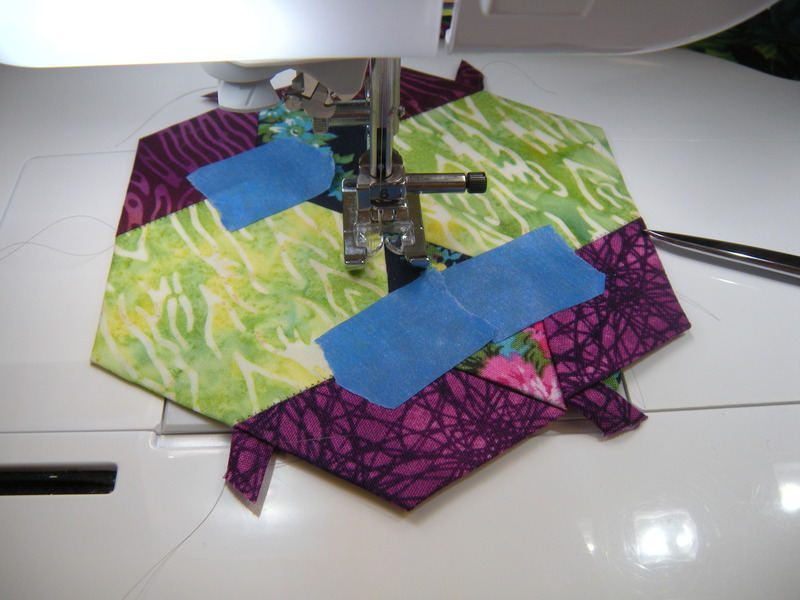 Just lay the stitched section on top of the stack, lining it up with it’s kin, and it’s easy to see what gets attached and where. 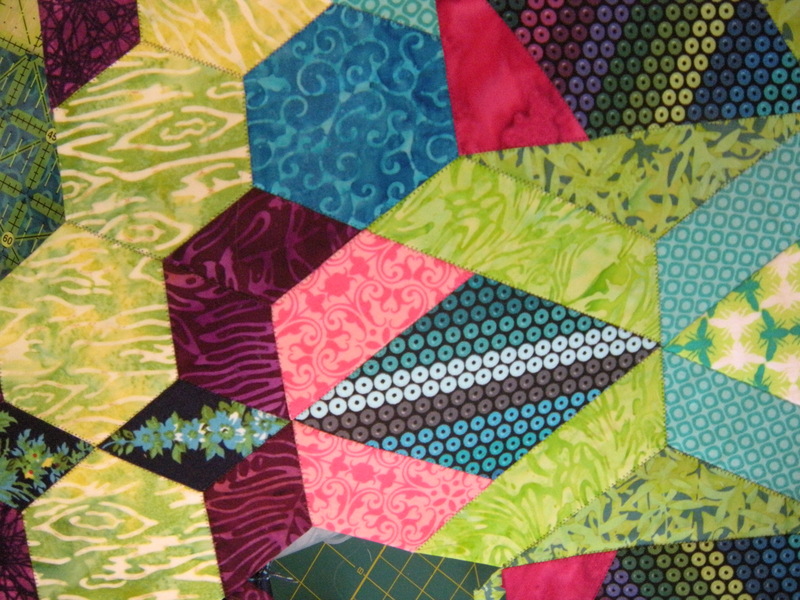 I tuck in the thread ends that are sticking out where the two green/yellow hexies meet. Tape them to the backside if they are misbehaving. And then do it! Tuh duh! Now keep on keepin’ on. Now you must stand back and admire this stack of yumminess! 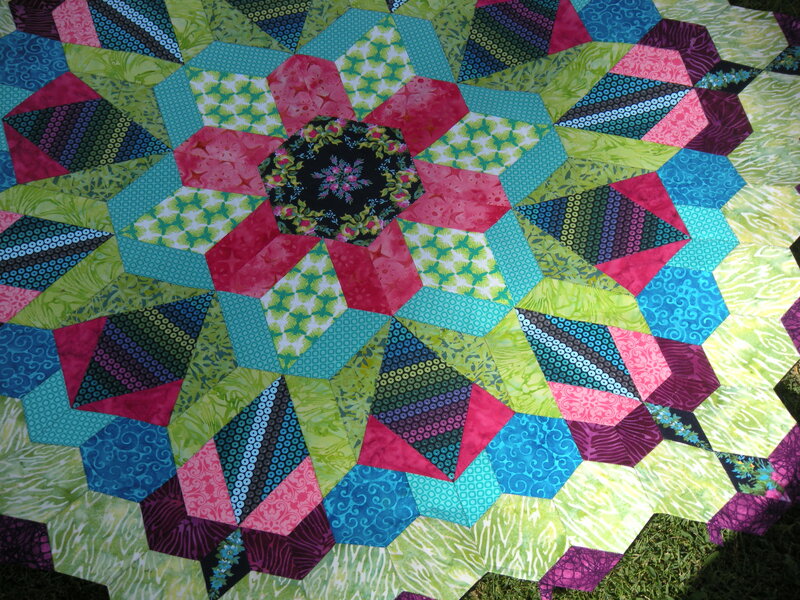 Tomorrow is the third (and final) part of the tutorial, where everything joins together to finish rosette one! 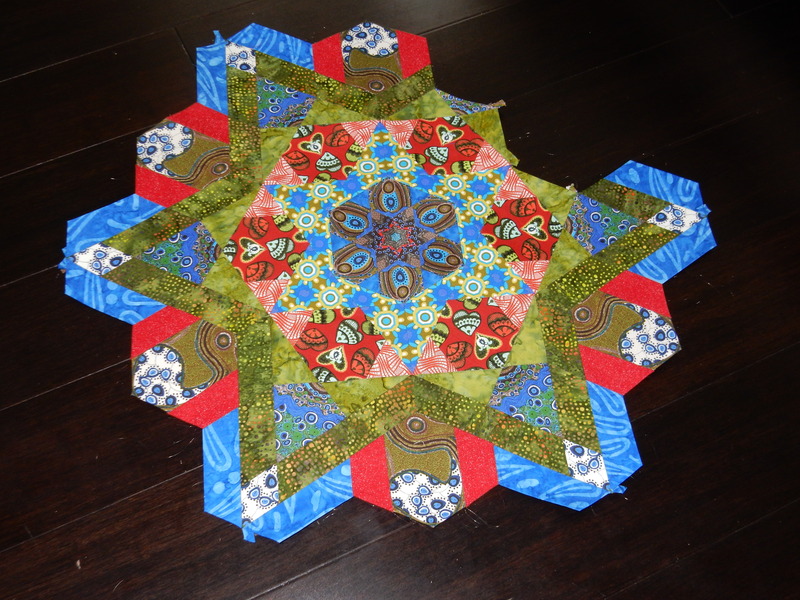 Just in time to start rosette 2. Tomorrow I’ll also talk about popping out the papers. My fingers are getting tired of talking today. 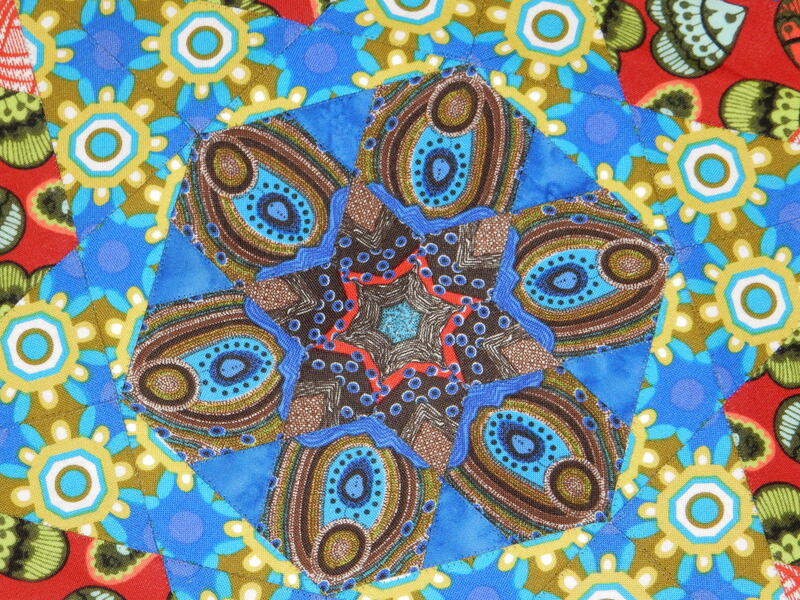 Now stop reading and go make something pretty! 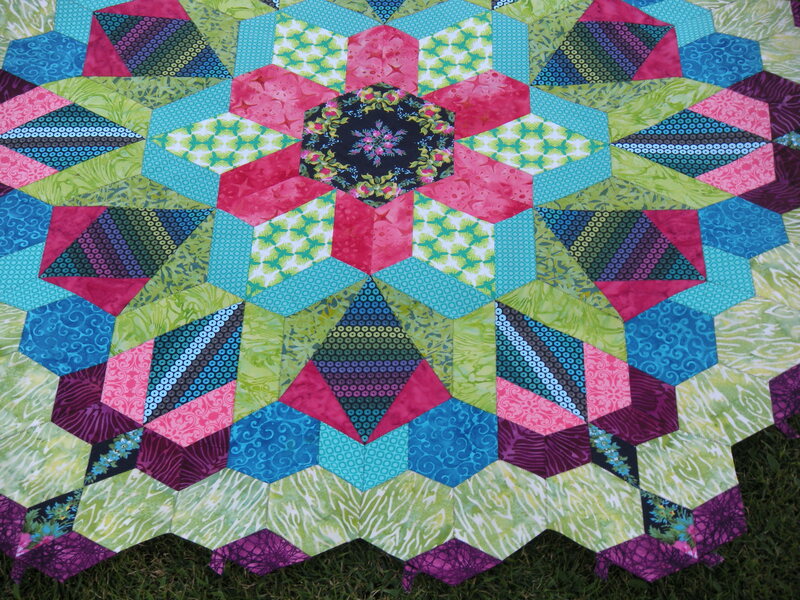 Ooh, here’s an idea…how to make this project happen without spending every waking moment hand stitching. 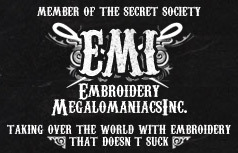 Because, frankly, I’ve spent a good part of my life trying to avoid hand sewing. I know I’m not the only one out here that wants to do this project, but NOT by hand! First, get all your pieces prepped. Just follow Katja’s directions in the book. 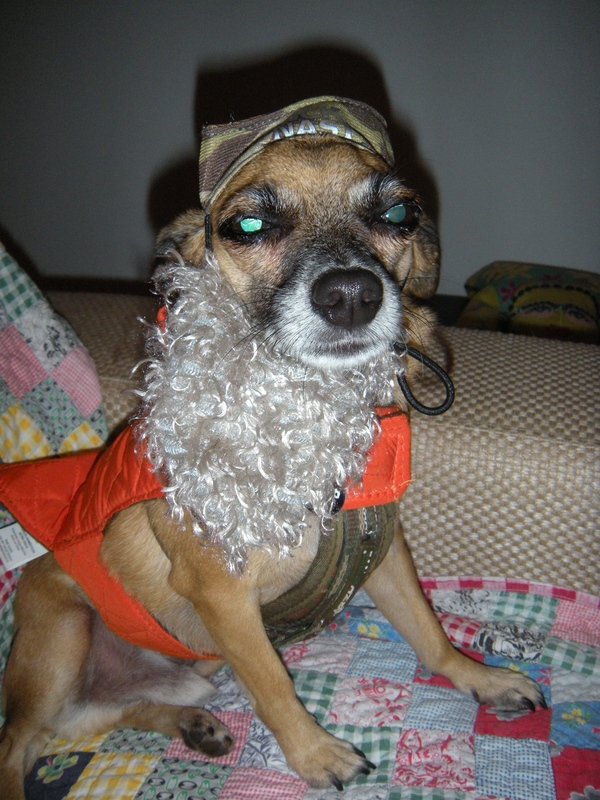 She’s got this part on lock and load. 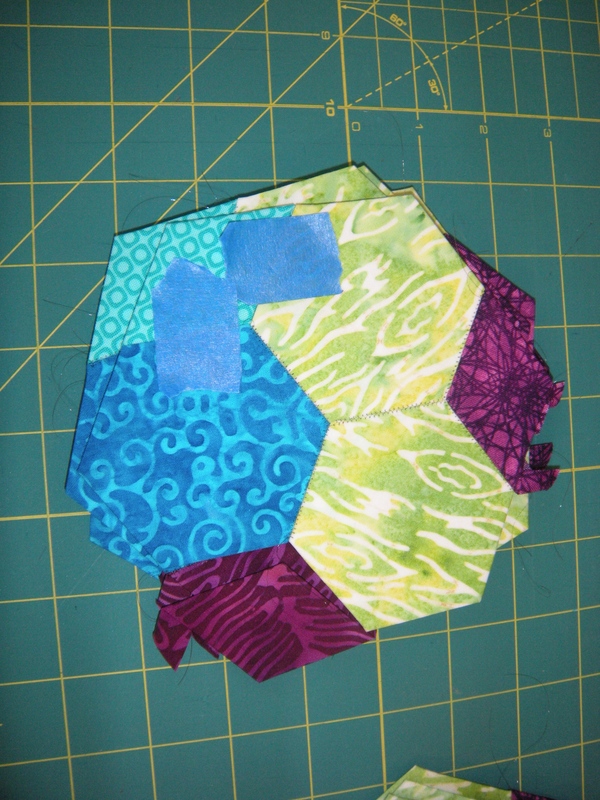 Count how many you need of each shape, each fabric. 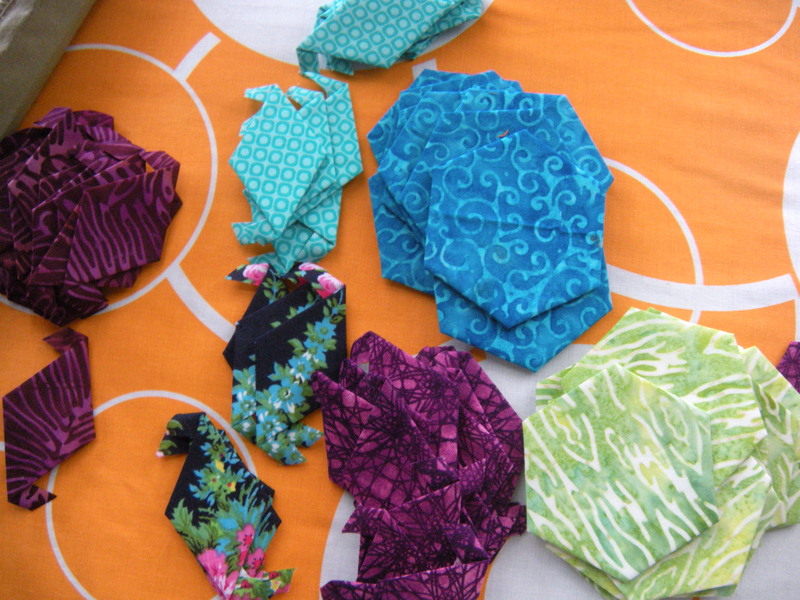 Make them into little piles. 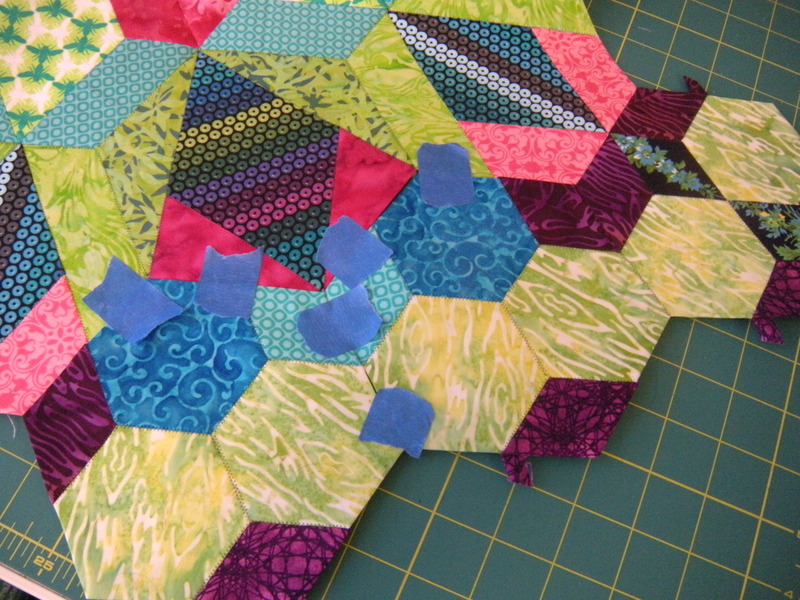 Now lay out the hexagons. 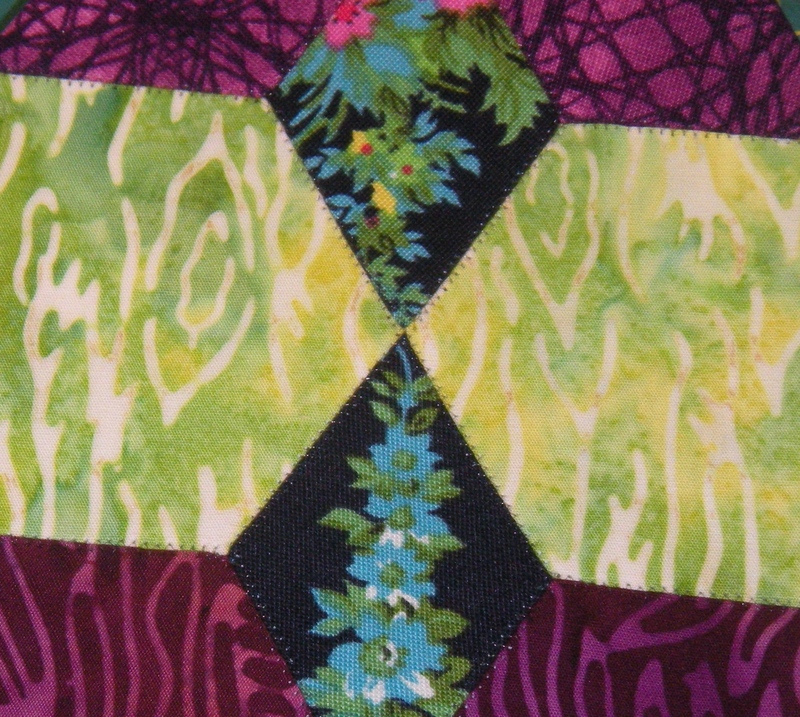 This is block 12 from the book. 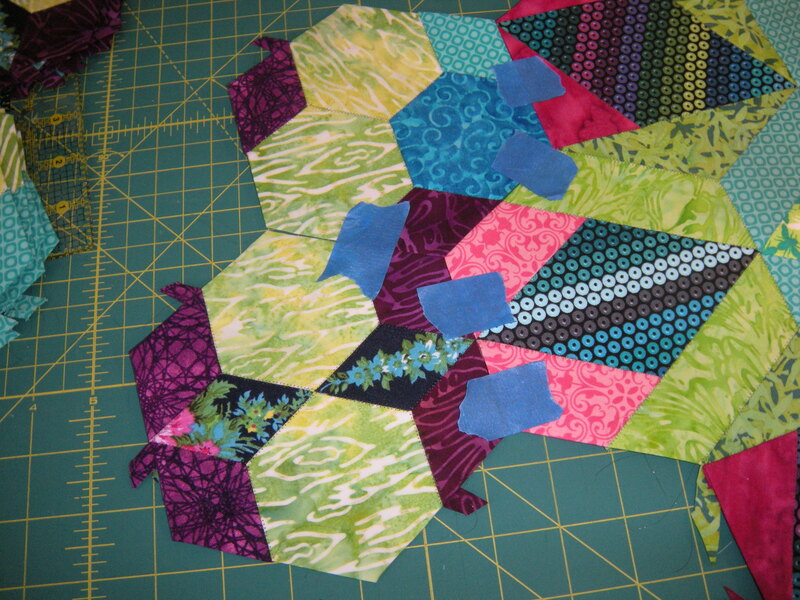 Just stack up all the sets you need, in this case, 6 of block 12, laid out just like they need to be joined. 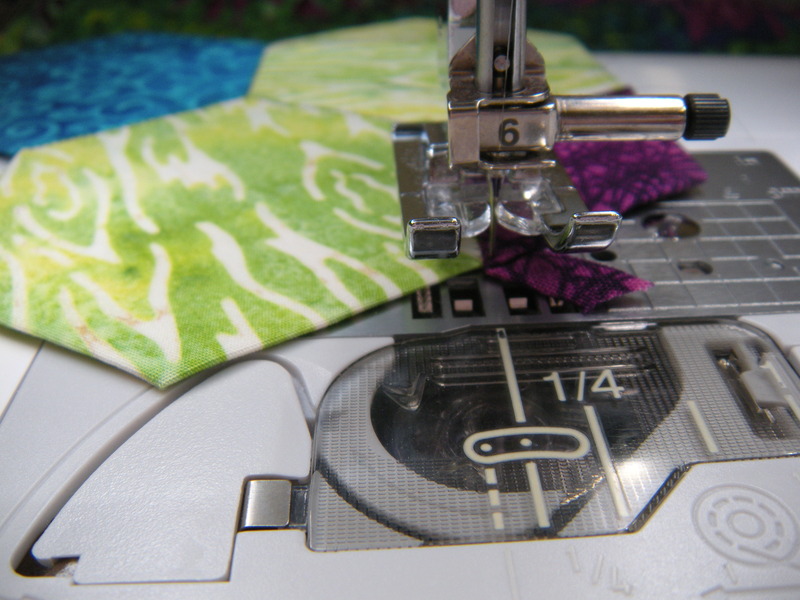 The next step is to determine your logical sewing sequence, which seams to join first to minimize the number of starts and stops. 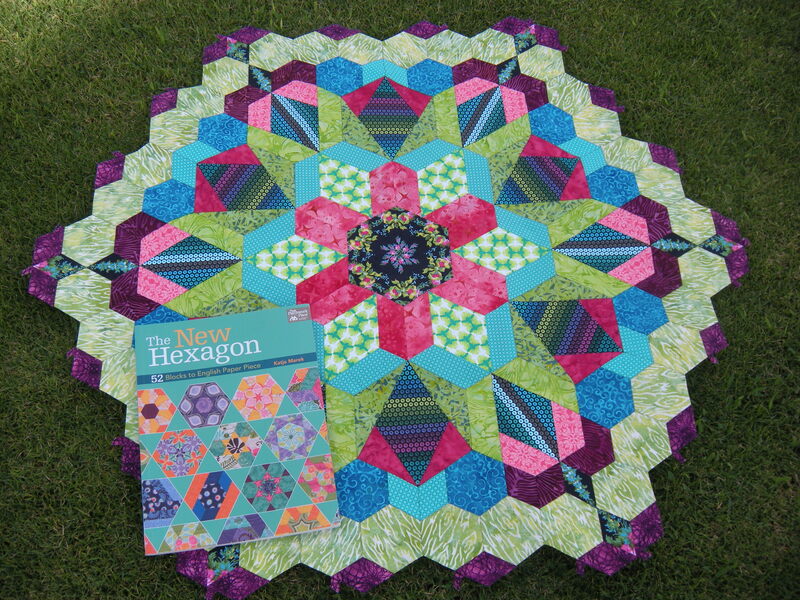 In this case, joining each green hexagon to the purple diamonds above and below it. 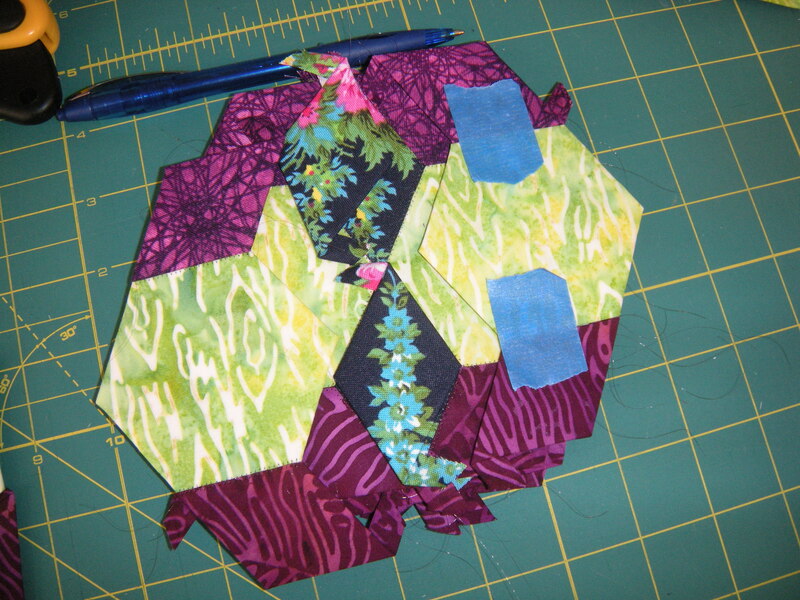 Use blue painter’s tape to hold together the pieces to be joined. Comes off without a gooey mess. 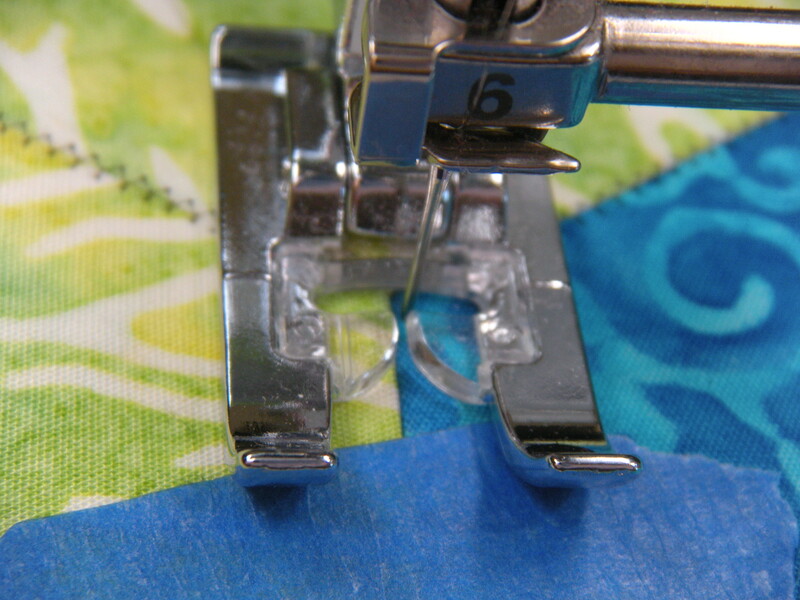 The thread I am using is a smoke colored invisible thread, top and bobbin. 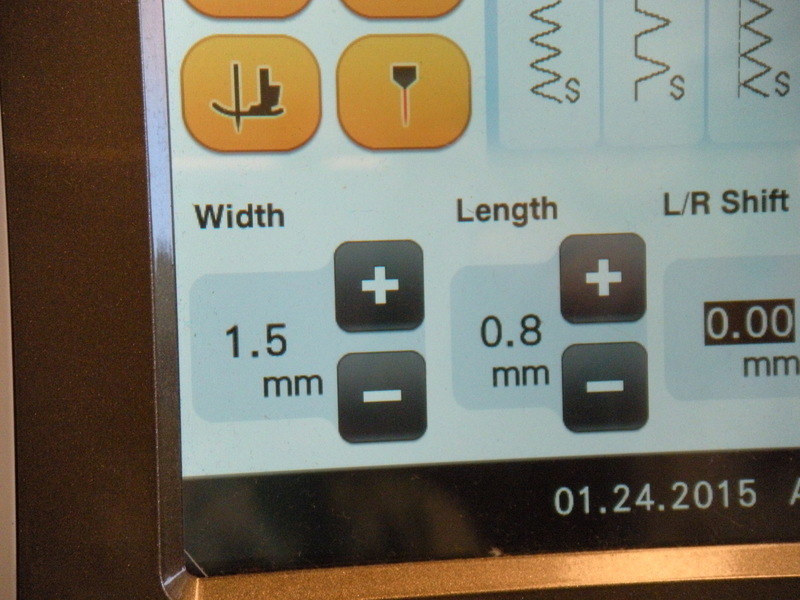 I set the machine on zig-zag, 1.5mm width, .8mm length. 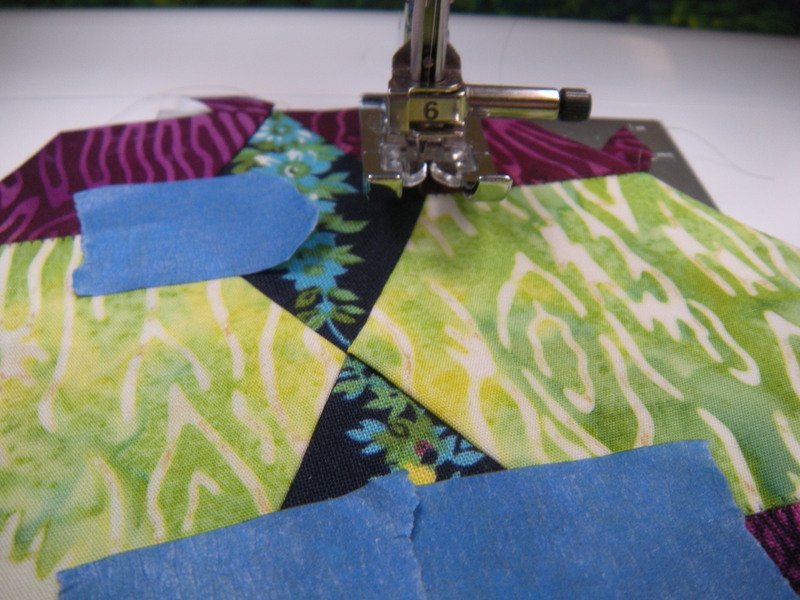 Use a thin, sharp needle. 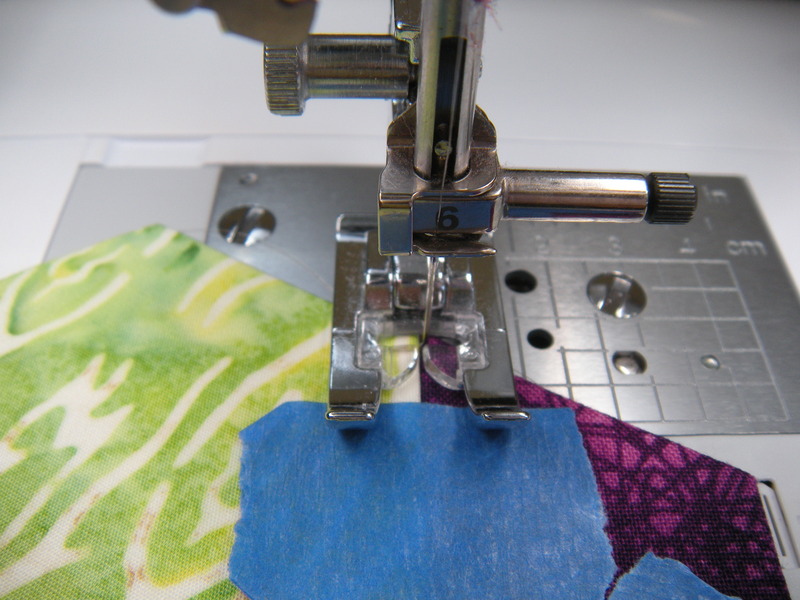 I’m using a size 10 Microtex needle. 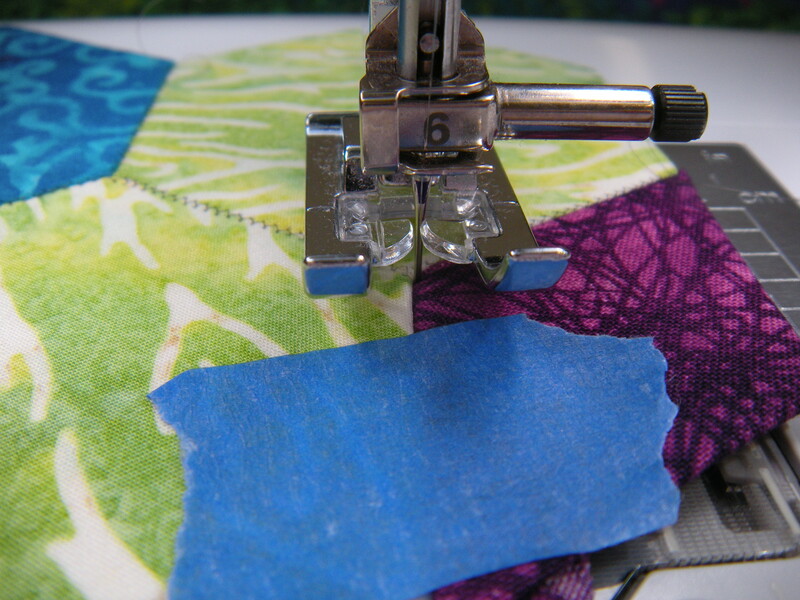 Use a foot that allows good visibility to the needle. 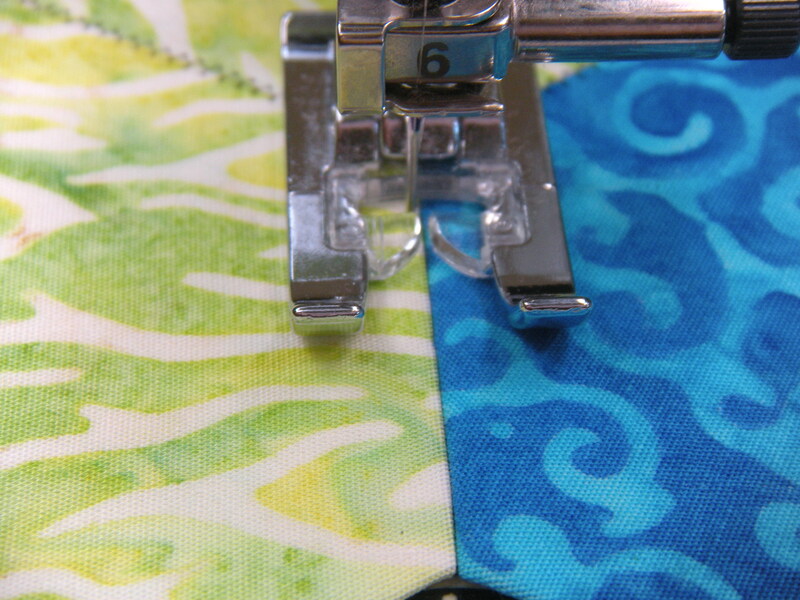 Anchor the thread with a lockstitch at each end, catching each side with the zig-zag stitch. 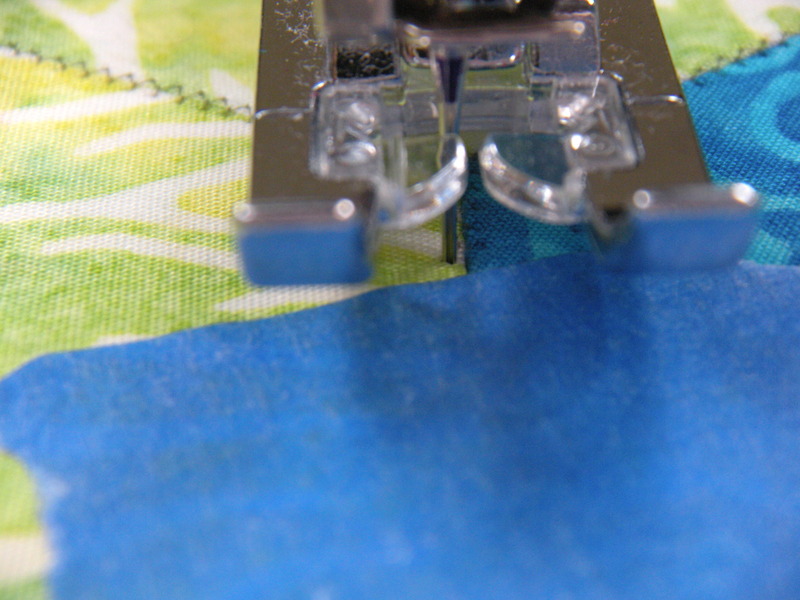 Don’t trim the thread ends. 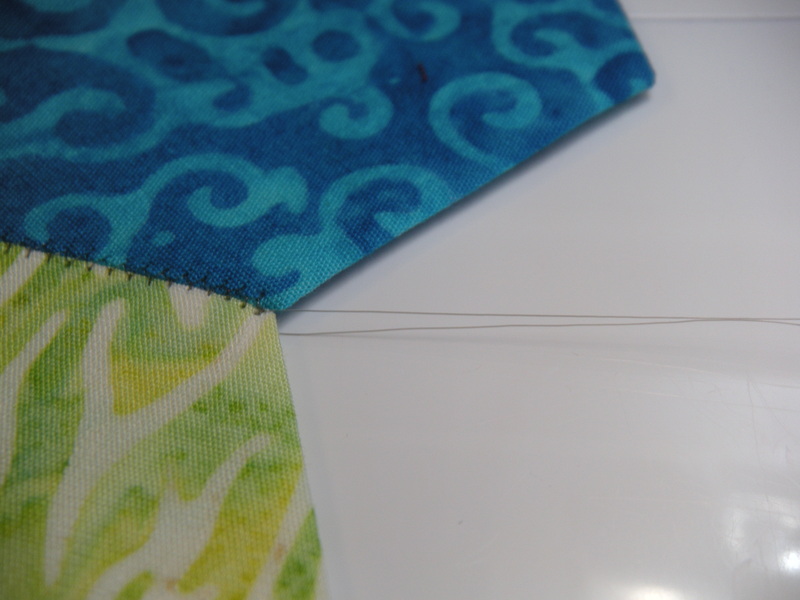 Think about the thread like little whiskers…if you cut them short they feel all pokey. 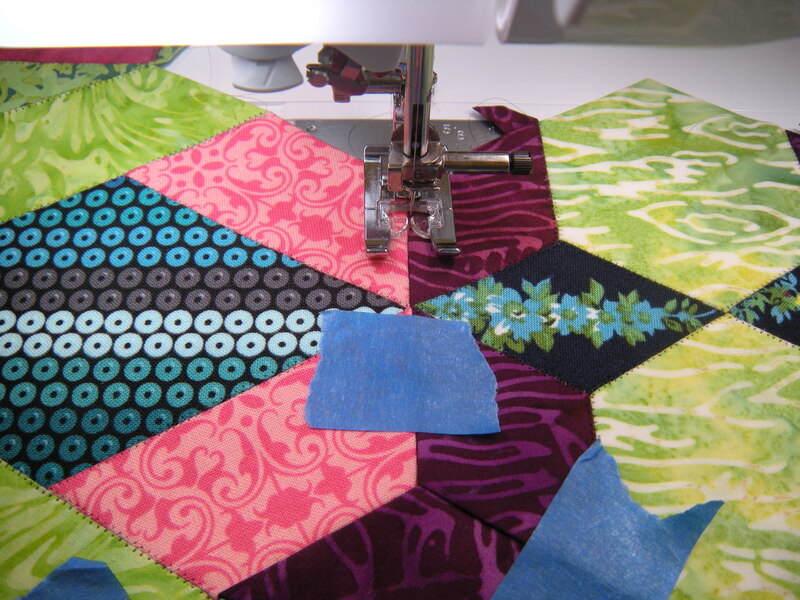 Leave them long and tuck them to the inside as you join more pieces together. Two sides, ready for the middle. 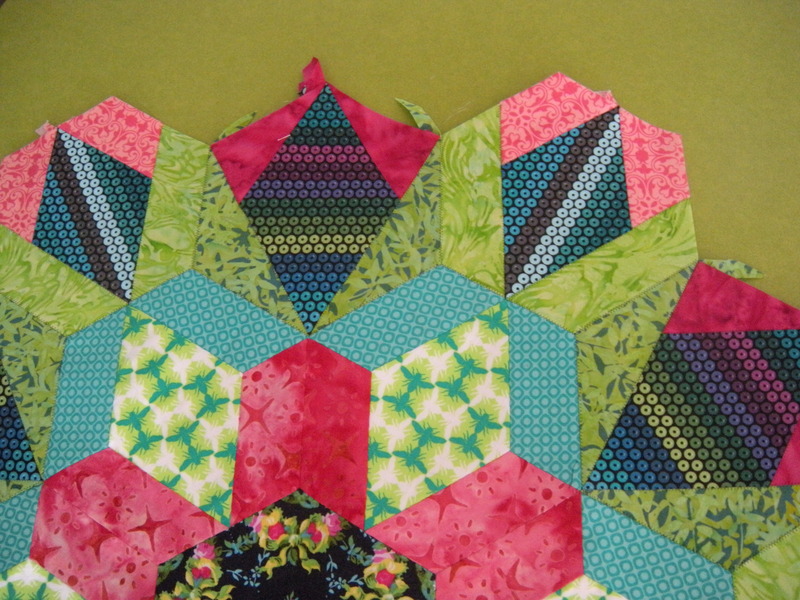 Tape both of the center diamonds in place, double-checking your directional prints. 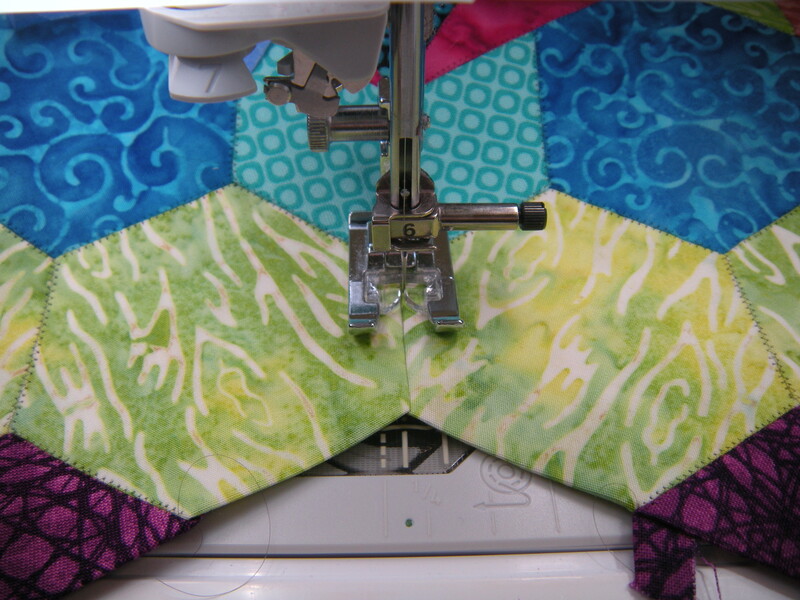 This part will be sewn in one big figure-8 shaped seam, pivoting at corners and ends. 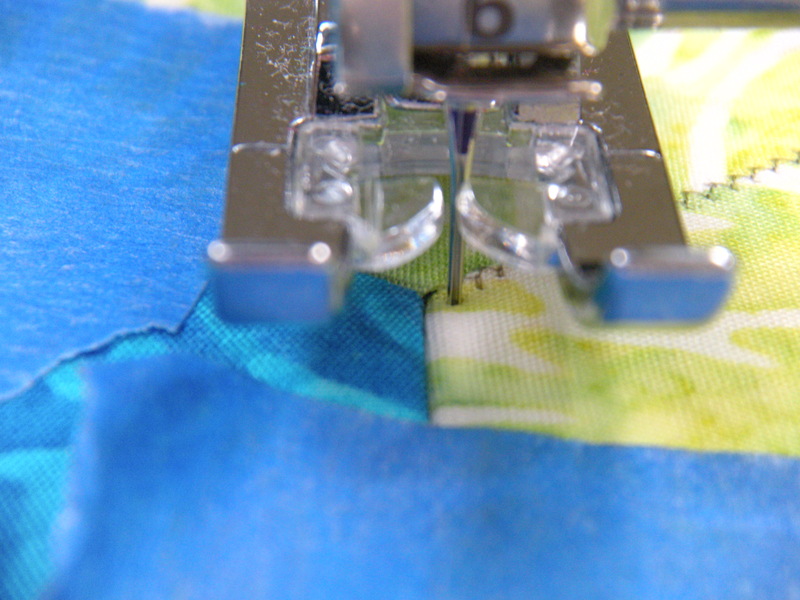 Pivot with the needle down in the fabric as shown in the second photo below. 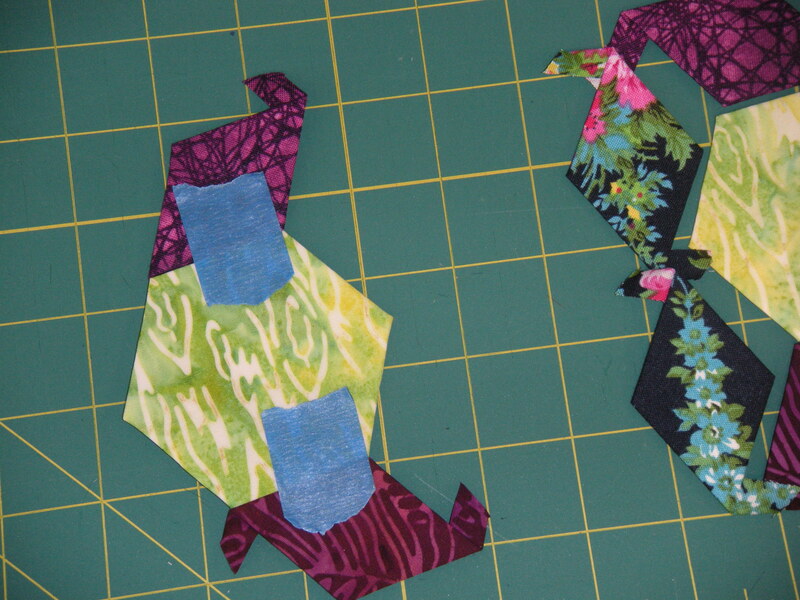 In this case, I am pivoting towards the navy fabric, so the needle is down in the navy fabric when I pivot. 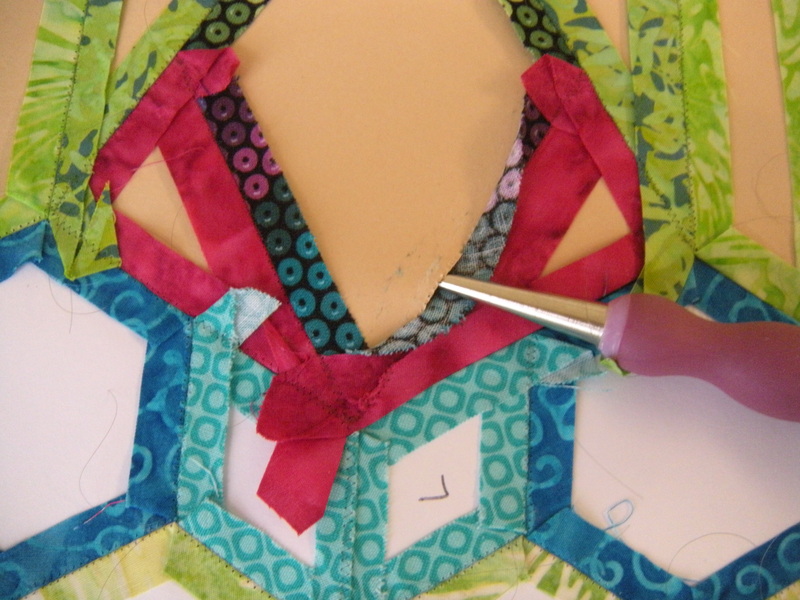 The third photo shows the stitching continuing down to the second diamond, and then pivoting at the little pink point, the bottom of the figure-8, to return up the other side to finish. 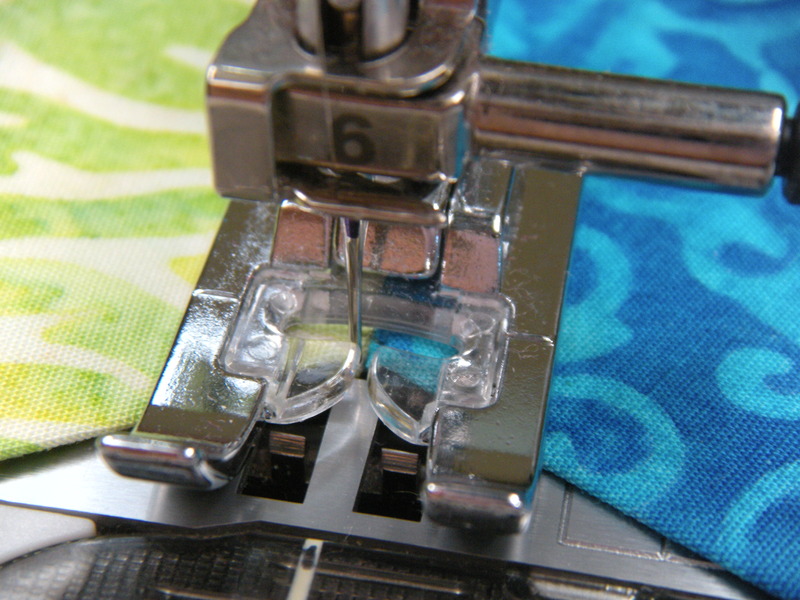 Make sure you lock the stitching at the beginning and end of the eight. I tucked in all the little tails and the thread ends. 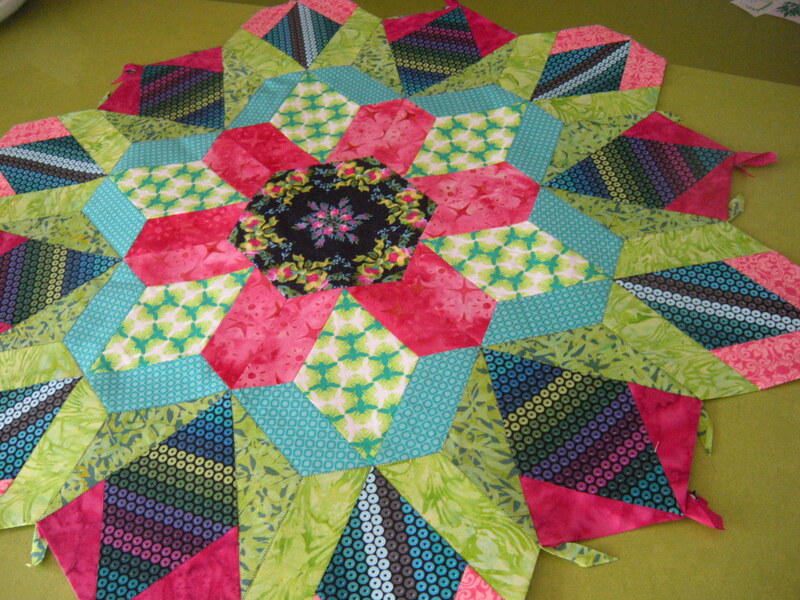 Let me just tell you that the entire stack of 6 blocks took only a half hour to stitch together. One. Half. Hour. That’s it, just a half hour. 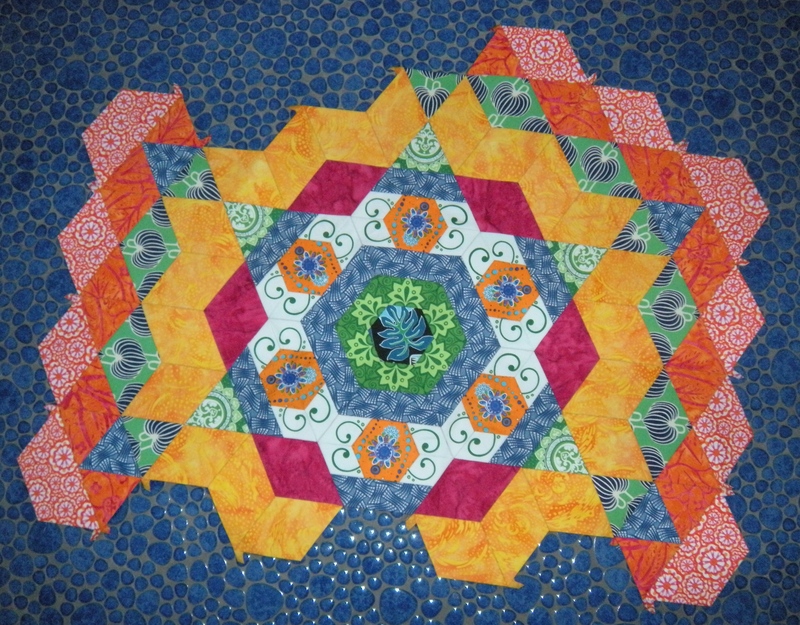 It took that long for me to join the first two sections of the center. 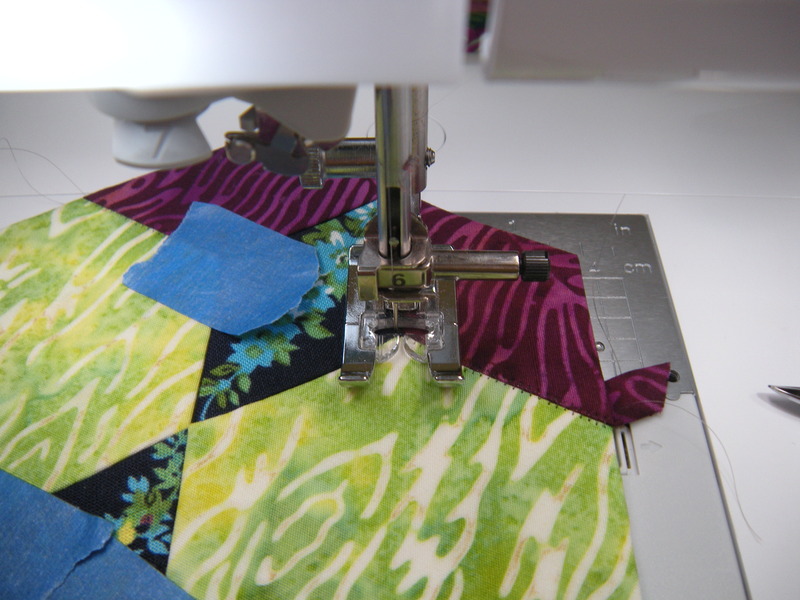 And did I mention that the entire second round of my rosette #1 was stitched by machine? Could you tell that when I posted the pictures the other day? 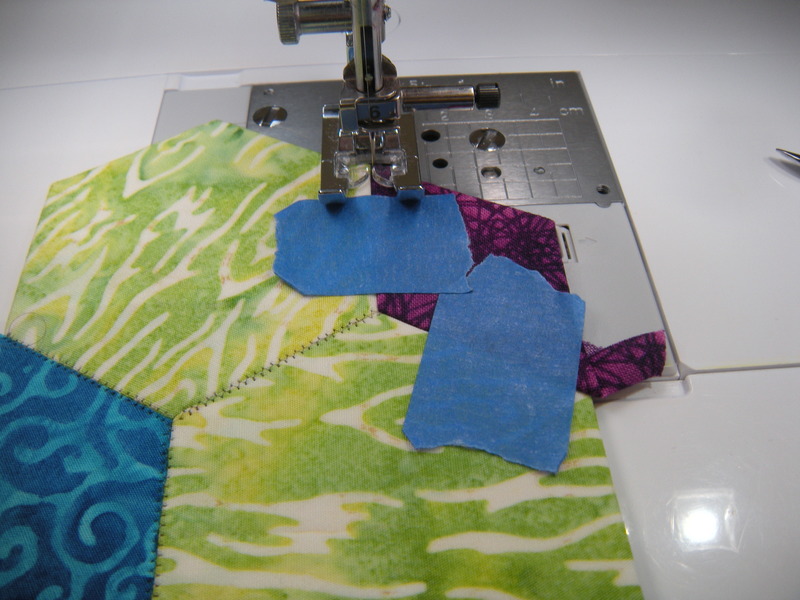 Part two of this tutorial will include another example of utilizing a sewing sequence. 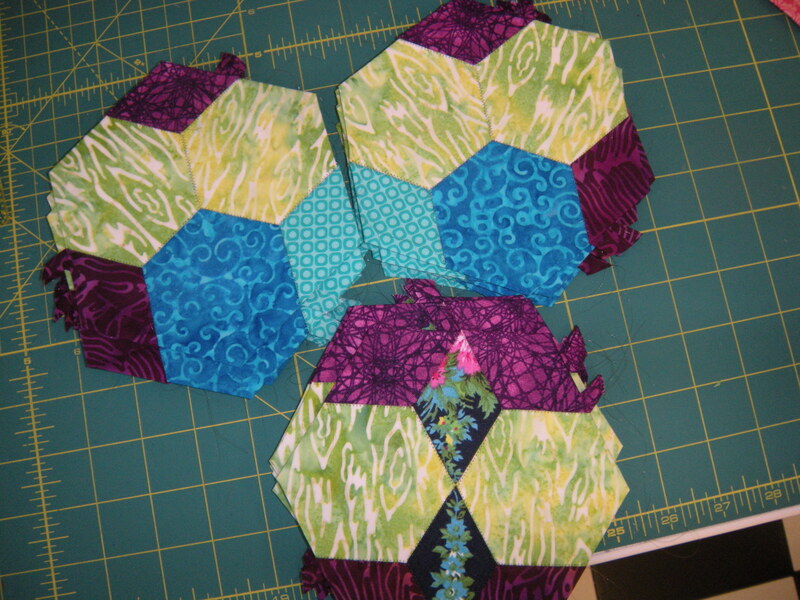 I’ll also show how the hexies are joined to the previous rounds. Stayed tuned for that big pile of fun. A special thanks today to Brandi. And also a shout out to Doris, Marilyn, Maureen and Debbie.